Indicate by check mark whether the Registrant is a large accelerated filer, an accelerated filer, or a non-accelerated filer. See definition of accelerated filer and large accelerated filer in Rule 12b-2 of the Exchange Act. The aggregate market value of the Common Stock held by non-affiliates of the Registrant at June 30, 2009, was approximately $61,457,206. Number of shares of Common Stock, $0.001 par value, outstanding as of March 12, 2010: 56,847,612 shares. Items 10, 11, 12, 13 and 14 of Part III of this Form 10-K report are incorporated by reference to the Registrants Definitive Proxy Statement for the Registrants 2009 Annual Meeting of Stockholders. The Company or Registrant or URI is used in this report to refer to Uranium Resources, Inc. and its consolidated subsidiaries. This 10-K contains forward-looking statements. These statements include, without limitation, statements relating to managements expectations regarding the Companys ability to remain solvent, capital requirements, mineralized materials, timing of receipt of mining permits, production capacity of mining operations planned for properties in South Texas and New Mexico and planned dates for commencement of production at such properties, business strategies and other plans and objectives of the Companys management for future operations and activities and other such matters. The words believes, plans, intends, strategy, projects, targets, or anticipates and similar expressions identify forward-looking statements. The Company does not undertake to update, revise or correct any of the forward-looking information. Readers are cautioned that such forward-looking statements should be read in conjunction with the Companys disclosures under the heading: Risk Factors beginning on page 9. Certain terms used in this Form 10-K and other industry terms are defined in the Glossary of Certain Terms appearing at the end of Part I hereto. Uranium Resources, Inc. (URI) is a uranium exploration, mine development and production company. We were organized in 1977 to acquire and develop uranium mines in South Texas using the in-situ recovery mining process (ISR). Since its founding, URI has produced over 8 million pounds U3O8 from five Texas projects, two of which have been fully restored and returned to the land owners. The Company currently has two fully licensed ISR processing facilities in Texas: Kingsville Dome and Rosita. Since 1986, the Company has built a significant asset base in New Mexico that includes 101.4 million pounds U3O8 of in-place mineralized uranium material on 183,000 acres of uranium mineral holdings. We have also been issued a Nuclear Regulatory Commission (NRC) license to build a 3 million pound U3O8 per year ISR processing facility at Crownpoint, New Mexico. As of March 12, 2010 we had 30 employees. URI holds a NRC source materials license to build and operate an ISR uranium processing facility on company-owned property at Crownpoint, New Mexico. The license allows for ISR mining at the Churchrock and Crownpoint projects that together hold nearly 34 million pounds U3O8 of in-place mineralized uranium material. The license allows for the production of up to 1 million pounds per year from Churchrock until a successful commercial demonstration of restoration is made; after which the quantity of production can be increased and mining on other properties can begin. Total production under the license is limited to 3 million pounds U3O8 per year. This project is currently being delayed due to depressed uranium prices and by a lawsuit to determine whether the U.S. Environmental Protection Agency (USEPA) or the State of New Mexico has the jurisdiction to issue the Underground Injection Control (UIC) program permits. The Company believes production could begin within 18 - 24 months after obtaining this permit assuming the market for uranium improves. Overall in New Mexico, the Company owns 183,000 acres of mineral holdings that contain approximately 101.4 million pounds U3O8 of in-place mineralized uranium material that has been verified by an independent engineering firm. A substantial amount of our total acreage remains unexplored or currently has insufficient data to estimate in-place mineralized materials. These properties were acquired during the 1980s and 1990s along with a vast database of exploration logs and drill results that were developed by Conoco, Homestake Mining, Mobil Oil, Kerr-McGee, Phillips Petroleum, United Nuclear and Westinghouse Electric Corporation. Three of our properties were in various stages of being developed as conventional underground mines in the early 1980s with a total designed capacity to produce approximately 4.5 million pounds U3O8 per year. We also possess a 16.5% royalty interest on a partial section of the Mount Taylor Mine owned by Rio Grande Resources, a division of General Atomics. Since 2007, we have digitized approximately 18,800 drill logs in order to secure the data and allow for easier analysis of drill hole information. These logs total nearly 23 million feet of hole drilled in the 1970s and 1980s with an estimated drilling and logging replacement cost of $700 million. The Company plans to develop its uranium assets in New Mexico using the most economic and efficient method for each project and will be subject to improvements in uranium prices. These mining methods may include the use of ISR, old stope leaching, and conventional mining techniques. uranium sales between 2000 and the fourth quarter of 2004, and therefore had to rely on equity infusions to fund operations and maintain our critical employees and assets. After uranium prices rose significantly in 2004, we placed our South Texas Vasquez property into production during the fourth quarter of that year. In April 2006, Kingsville Dome returned to production followed by a startup of Rosita in June 2008. From 2004 to the end of 2009, these three projects produced a total of 1.4 million pounds of U3O8. The Vasquez project was mined out in 2008 and is now being restored. Rosita production was shut-in in October 2008 due to depressed pricing and technical challenges in the first new wellfield that made mining uneconomical. The decline in uranium prices throughout 2008 also led to a decision in October 2008 to defer new wellfield development at Rosita and Kingsville Dome. Production continued in two existing wellfields at Kingsville Dome and was completed in July 2009. The Company has not had any operating mines in Texas since that time, and does not plan to return to production until uranium prices recover. The Company believes it has sufficient in-place mineralized uranium material to produce a total of 300,000 to 500,000 pounds U3O8 over a one to two year period should realized uranium prices recover to a profitable level. Production could begin within 6 - 12 months after a decision to restart is made. Longer-term, additional production could come from new production area authorizations at Kingsville Dome, however, this may take a considerable period of time given local opposition and there can be no assurance that such production will be realized. On March 6, 2009, URI received notification from Itochu Corporation (Itochu) terminating URIs joint venture with Itochu to develop our Churchrock property in New Mexico. The Joint Venture provided Itochu an opportunity to participate in New Mexico uranium production in exchange for renegotiating their sales contract with the Company. The contract had also included a provision that allowed the Company to receive up to an additional $2.10 per pound for certain South Texas uranium production sold to Itochu from 2006 through the termination of the Joint Venture on March 6, 2009. As a result of the termination of the joint venture, URI now retains 100% ownership of the 18.6 million pounds of in place mineralized uranium material subject to applicable royalties based on sales at Churchrock. However we presently have no committed source of financing for development of this project. On April 17, 2009, a three-judge panel of the United States Court of Appeals for the Tenth Circuit affirmed the USEPA decision and held that Section 8 of URIs Churchrock property in New Mexico is Indian Country. One of the members of the panel dissented. The Company petitioned the Tenth Circuit for and was granted an en banc review of the panels decision. Oral arguments were presented to the Court on January 12, 2010 and we are waiting for the Court to render a decision. In July, 2009, URI entered into a definitive agreement to purchase from NZ Uranium, LLC (NZU) 113,000 acres of mineral rights in the Crownpoint area of New Mexico, however in September, 2009, the agreement for the acquisition was terminated because of the existence of title issues that were not resolved. On September 3, 2009, David N. Clark stepped down as the President and Chief Executive Officer and a Director of the Company. At that time, the Board appointed Donald C. Ewigleben as President, CEO and COO to succeed Mr. Clark and also named Mr. Ewigleben as a director to fill the vacancy on the Board created by Mr. Clarks resignation. In October 2009, the New Mexico Mining and Minerals Division approved the Companys request for a renewal of the Minimal Impact Exploration Permit Application on its Section 13 in-situ (ISR) exploration project. 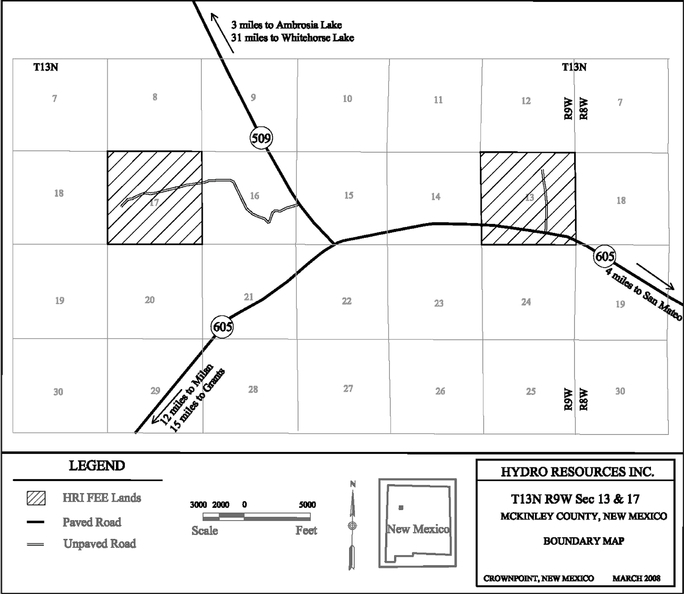 Section 13 is in Ambrosia Lake (See New Mexico Properties-Potential ISR and OSL areas), the historic mining district near Grants, New Mexico. The permit allows URI to drill up to 10 holes for the purpose of extracting core samples to evaluate the suitability of the property for ISR mining and we intend to perform these drilling activities within the current permitting period. URI owns the Section 13 property in fee and the permit renewal is now valid until November 2010.
restoration in Production Areas (PA) #1 and #2 and began pre-restoration preparations on PA#3 in the 3rd quarter of 2009. Full-scale restoration in the fully depleted wellfields of PA#3 is expected to begin in the 1st quarter of 2010. The Company in conjunction with the Kenedy Memorial Foundation (the Foundation), conducted testing on 165 water wells on a portion of the Kenedy Ranch, located in South Texas for the presence of radium and radon to determine if there is a potential for uranium mineralization. These tests were conducted in 2009, the results have been evaluated and the Company is in the process of presenting the findings to the Foundation. The Company is also working with Texas A&M-Kingsville to evaluate the use of dissolved hydrogen to enhance bioremediation of mined zones at Kingsville Dome. A test was completed on a small portion of a previously mined wellfield at Kingsville Dome in 2009. The analysis of the test results is ongoing and is expected to be completed by the end of 2010. We are also working with other active ISR mining companies as well as several government labs and agencies including Sandia National Laboratory, Los Alamos National Laboratory and the United States Geological Service, on methods to improve the efficiency of groundwater restoration at ISR wellfields. During 2009, our focus in New Mexico was on government and public relations activities needed to advance toward production at all of our projects, with our fully licensed Churchrock mine of the Crownpoint Project as a priority. The Company also undertook a study with the Navajo Nation EPA to perform a comprehensive environmental characterization of the Churchrock mine site at Section 17 and lands adjacent to the site area. This study was completed in September 2009 and concluded that any off-site mine-related impacts at Section 17 and adjacent lands are expected to be minor. We will continue to work with the Navajo Nation in this endeavor to achieve the remediation objectives. The Company has adopted a new strategic plan which emphasizes cash preservation as its priority. The Company is committed to seeking sources of near to mid-term sources of capital to provide sufficient working capital for the Company to maintain its liquidity through at least 2011. The strategic plan also includes the development of options for unlocking potential value for shareholders by utilizing the Companys current assets and by evaluating possible regional and structural synergies. Key operational points of the strategic plan for our Texas properties include (1) positioning the Company to return to production in Texas should the price of uranium return to a level sufficient to generate positive cash flow; (2) complete an analysis of the exploration potential in South Texas and enhance the Companys exploration capabilities; (3) continue to maintain our restoration activities in South Texas in accordance with the Companys existing agreements and regulatory requirements and (4) analyze any synergistic opportunities and potential asset monetization prospects in Texas. In New Mexico, our strategic plan calls for continuing to advance our discussions with others in the region that also hold uranium assets, as well as with entities that would benefit from the production of the uranium. In addition, we will continue our communication efforts with the local communities, State and local governments and the Navajo Nation to address legacy issues while continuing education efforts on the safety of todays uranium mining practices with the objective of bridging the gap that currently exists between uranium mining entities and others with stakeholder interests in the State. In accordance with the SECs Guideline on Non-Reserve Mineralized Material, and as shown in the following table, we estimate 101.4 million pounds of in-place mineralized uranium material on our New Mexico properties as of December 31, 2009. This estimate reflects our ongoing reevaluation of our New Mexico properties, including our decision to consider development of certain properties by conventional mining and milling methods in addition to ISR methods. The estimate for each New Mexico property is based on studies and geologic reports prepared by prior owners, along with studies and reports prepared by geologists engaged by the Company. The estimates presented below were reviewed and affirmed by Behre Dolbear & Company (USA) an independent private engineering firm in their report dated February 26, 2008. Since the date of the report, the Company has maintained its ownership position on these properties, the properties have not been subject to any production activities and the estimates remain unchanged. The following table summarizes our estimates of Proven Reserves for our Kingsville Dome and Rosita properties in South Texas. These estimates have been produced by the Companys professional engineering and geologic staff. Prior to March 2006 we had two contracts with Itochu Corporation and two with UG USA, Inc. Under those contracts we were obligated to deliver an aggregate of 600,000 pounds in each of the years 2005 through 2008, and the buyer had the right to increase or decrease those deliveries by 15%. The average price for such deliveries was $17.95 per pound in 2005 and was anticipated to have been $14.58 per pound in 2006. These contracts were entered into at a time when the spot price for uranium was less than $15 per pound, substantially below the $40 per pound in effect as of March 25, 2006. Two other contracts with these buyers called for aggregate deliveries of 645,000 pounds by December 31, 2007 priced at the spot price at the time of delivery less an average of $3.80 per pound. In March 2006 we entered into new contracts with Itochu and UG that superseded the existing contracts. Each of the new contracts calls for delivery of one-half of our actual production from our Vasquez property and other properties in Texas currently owned or hereafter acquired by the Company (excluding certain large potential exploration plays). The terms of these new contracts are summarized below. The Itochu Contract. Under the Itochu contract all production from the Vasquez property will be sold at a price equal to the average spot price for the eight weeks prior to the date of delivery less $6.50 per pound, with a floor for the spot price of $37.00 per pound and a ceiling of $46.50 per pound. Other Texas production will be sold at a price equal to the average spot price for the eight weeks prior to the date of delivery less $7.50 per pound, with a floor for the spot price of $37.00 per pound and a ceiling of $43.00 per pound. On non-Vasquez production the price paid will be increased by 30% of the difference between the actual spot price and the $43.00 ceiling up to and including $50.00 per pound. If the spot price is over $50.00 per pound, the price on all Texas production will be increased by 50% of such excess. The floor and ceiling and sharing arrangement over the ceiling applies to 3.65 million pounds of deliveries, after which there is no floor or ceiling. Itochu has the right to cancel any deliveries on six-months notice. Since the inception of the new contract through December 31, 2009 we have delivered approximately 510,000 pounds to Itochu. On December 5, 2006, HRI-Churchrock, Inc., a wholly-owned subsidiary of the Company, entered into an agreement with a wholly-owned subsidiary of Itochu to develop jointly our Churchrock property in New Mexico (the Joint Venture). This agreement was terminated on March 6, 2009. (See BusinessJoint Venture for Churchrock Property, below). completed in April 2006. Since the inception of the new contract through December 31, 2009 we have delivered approximately 482,000 pounds to UG. On December 5, 2006, HRI-Churchrock, Inc., a wholly-owned subsidiary of the Company, entered into a Joint Venture with a wholly-owned subsidiary of Itochu to develop jointly our Churchrock property in New Mexico. The Joint Venture provided Itochu an opportunity to participate in New Mexico uranium production in exchange for renegotiating their sales contract with the Company. The new contract included a provision to allow the Company to receive up to an additional $2.10 per pound for certain South Texas uranium production sold to Itochu. A feasibility study was completed and delivered at the end of 2006 at a cost of $675,000 that was funded by Itochu. Under the terms of the Joint Venture, both parties had until April 2, 2007 to make a decision regarding whether to move forward with the Joint Venture. That date was ultimately extended until March 2, 2009. On March 6, 2009 we received notification that Itochu had decided to terminate the Joint Venture. This eliminated the potential for reinstatement of the original delivery contracts with Itochu for South Texas production. However, depending on spot market prices, our sales price may be reduced by up to $2.10 per pound on some of our South Texas production for future deliveries under the Itochu contract. As a result of the termination of the joint venture, the Company now retains 100% ownership of the 18.6 millions pounds of in place mineralized uranium material subject to applicable royalties based on sales at Churchrock. However, we presently have no committed source of financing for development of this project. The only significant commercial use for uranium is as a fuel for nuclear power plants for the generation of electricity. According to the World Nuclear Association (WNA), as of February 2010 there were 436 nuclear power plants operating in the world with an annual consumption of about 162 million pounds of uranium. In addition, the WNA lists 53 reactors under construction, 142 being planned, and 327 being proposed. Based on reports by Ux Consulting Company, LLC, or Ux, the preliminary estimate for worldwide production of uranium in 2009 is 120 million pounds. Ux reported that the gap between production and demand was filled by secondary supplies, such as inventories held by governments, utilities and others in the fuel cycle, including the highly enriched uranium, or HEU, inventories which are a result of the agreement between the US and Russia to blend down nuclear warheads. These secondary supplies are currently meeting nearly a third of worldwide demand, but are depleting. Spot market prices rose from $21.00 per pound in January 2005 to a high of $136.00 per pound in June 2007 in anticipation of sharply higher projected demand as a result of a resurgence in nuclear power, and by the fact that secondary supplies are either becoming depleted or will not be available. The sharp price increase was driven in part by high levels of utility buying, which resulted in most utilities covering their requirements through 2009. A decrease in near-term utility demand coupled with rising levels of supplies from producers and traders led to downward pressure being placed on uranium prices since the third quarter of 2007. The spot market price for uranium began in January 2009 at $53.00 per pound and ranged between a low of $40.00 per pound in April to a high of $54.00 per pound in June. The spot price closed 2009 at $44.50 per pound As of March 8, 2010, the spot price was $40.75 per pound and the long-term contract price was $60.00 per pound. We believe the higher long-term price reflects the continued strong future fundamentals for the uranium market. The following graph shows annual average spot prices per pound from 1982 to 2009 and the average price for the period January 1, 2010 to March 8, 2010, as reported by Trade Tech and Ux. The ISR mining process is a form of solution mining. It differs dramatically from conventional mining techniques. The ISR technique avoids the movement and milling of significant quantities of rock and ore as well as mill tailing waste associated with more traditional mining methods. It is generally more cost-effective and environmentally benign than conventional mining. Historically, the majority of United States uranium production resulted from either open pit surface mines or underground shaft operations. The ISR process was first tested for the production of uranium in the mid-1960s and was first applied to a commercial-scale project in 1975 in South Texas. It was well established in South Texas by the late 1970s, where it was employed in about twenty commercial projects, including two operated by us. In the ISR process, groundwater fortified with oxygen and other solubilizing agents is pumped into a permeable ore body causing the uranium contained in the ore to dissolve. The resulting solution is pumped to the surface. The fluid-bearing uranium is then circulated to an ion exchange column on the surface where uranium is extracted from the fluid onto resin beads. The fluid is then reinjected into the ore body. When the ion exchange columns resin beads are loaded with uranium, they are removed and flushed with a salt-water solution, which strips the uranium from the beads. This leaves the uranium in slurry, which is then dried and packaged for shipment as uranium concentrates. For greater operating efficiency and lower capital expenditures, when developing new wellfields we use a wellfield-specific remote ion exchange methodology as opposed to a central plant as we had done historically. Instead of piping the solutions over large distances through large diameter pipelines and mixing the waters of several wellfields together, each wellfield is being mined using a dedicated satellite ion exchange facility. This allows ion exchange to take place at the wellfield instead of at the central plant. A wellfield consists of a series of injection wells, production (extraction) wells and monitoring wells drilled in specified patterns. Wellfield pattern is crucial to minimizing costs and maximizing efficiencies of production. The satellite facilities allow mining of each wellfield using its own native groundwater. Uranium mining is regulated by the federal government, states and, where conducted in Indian Country, by Indian tribes. Compliance with such regulation has a material effect on the economics of our operations and the timing of project development. Our primary regulatory costs have been related to obtaining licenses and permits from federal and state agencies before the commencement of mining activities. U.S. regulations pertaining to climate change continue to evolve in both the U.S. and internationally. We do not anticipate any adverse impact from these regulations that would be unique to our operations. The Texas Commission of Environmental Quality (TCEQ) is the administrative agency with jurisdiction over the radioactive material license. For operations in New Mexico, radioactive material licensing is handled directly by the United States Nuclear Regulatory Commission. See Properties and Legal Proceedings for the status of our radioactive material license for New Mexico and our Texas properties. Underground Injection Control Permits (UIC). The federal Safe Drinking Water Act creates a nationwide regulatory program protecting groundwater. This law is administered by the United States Environmental Protection Agency (the USEPA). However, to avoid the burden of dual federal and state (or Indian tribal) regulation, the Safe Drinking Water Act allows for the UIC permits issued by states (and Indian tribes determined eligible for treatment as states) to satisfy the UIC permit required under the Safe Drinking Water Act under two conditions. First, the states program must have been granted primacy. Second, the USEPA must have granted, upon request by the state, an aquifer exemption. The USEPA may delay or decline to process the states application if the USEPA questions the states jurisdiction over the mine site. Texas has been granted primacy for its UIC programs, and the Texas Commission on Environmental Quality administers UIC permits. In addition to the radioactive materials license described above, the TCEQ also regulates air quality and surface deposition or discharge of treated wastewater associated with the ISR mining process. New Mexico has also been granted primacy for its program. The Navajo Nation has been determined eligible for treatment as a state, but it has not requested the grant of primacy from the USEPA for uranium related UIC activity. Until the Navajo Nation has been granted primacy, ISR uranium mining activities within Navajo Nation jurisdiction will require a UIC permit from the USEPA. Despite some procedural differences, the substantive requirements of the Texas, New Mexico and USEPA underground injection control programs are very similar. Properties located in Indian Country remain subject to the jurisdiction of the USEPA. Some of our properties are located in areas that are in Indian Country or in areas that are in dispute. See Properties and Legal Proceedings for a description of the status of our UIC permits in Texas and New Mexico. Other. In addition to radioactive material licenses and underground injection control permits, we are also required to obtain from governmental authorities a number of other permits or exemptions, such as for wastewater discharge, for land application of treated wastewater, and for air emissions. In order for a licensee to receive final release from further radioactive material license obligations after all of its mining and post-mining clean up have been completed in Texas, approval must be issued by the TCEQ along with concurrence from the United States Nuclear Regulatory Commission and in New Mexico by the United States Nuclear Regulatory Commission. In addition to the costs and responsibilities associated with obtaining and maintaining permits and the regulation of production activities, we are subject to environmental laws and regulations applicable to the ownership and operation of real property in general, including, but not limited to, the potential responsibility for the activities of prior owners and operators. The current environmental regulatory program for the ISR industry is well established. Many ISR mines have gone full cycle without any significant environmental impact. However, the public anti-nuclear lobby can make environmental permitting difficult and timing unpredictable. At the conclusion of mining, a mine site is decommissioned and decontaminated, and each wellfield is restored and reclaimed. Restoration involves returning the aquifer to its pre-mining use and removing evidence of surface disturbance. Restoration can be accomplished by flushing the ore zone with native ground water and/or using reverse osmosis to remove ions, minerals and salts to provide clean water for reinjection to flush the ore zone. Decommissioning and decontamination entails dismantling and removing the structures, equipment and materials used at the site during the mining and restoration activities. The Company is required by the State of Texas regulatory agencies to obtain financial surety relating to certain of its future restoration and reclamation obligations. The Company has a combination of bank Letters of Credit (the L/Cs) and performance bonds issued for the benefit of the Company to satisfy such regulatory requirements. The L/Cs were issued by Bank of America and the performance bonds have been issued by United States Fidelity and Guaranty Company (USF&G). The L/Cs relate primarily to our operations at our Kingsville Dome and Vasquez projects and amounted to $5,761,000 and $5,629,000, at December 31, 2009 and 2008, respectively. The L/Cs are collateralized in their entirety by certificates of deposit. The performance bonds were $2,835,000 on December 31, 2009 and 2008, and related primarily to our operations at Kingsville Dome and Rosita. USF&G has required that the Company deposit funds collateralizing a portion of the bonds, and we have deposited approximately $386,000 and $385,000 at December 31, 2009 and 2008, respectively, as cash collateral for such bonds. We are obligated by agreement with the bonding company to increase the cash collateral to an amount equal to 50% of the amount of the bonds, plus an additional $0.50 for each pound of uranium produced until the account accumulates an additional $1.0 million. We estimate that our actual reclamation liabilities for prior operations at Kingsville Dome, Vasquez and Rosita at December 31, 2009, are about $8.4 million of which the net present value of $5.5 million is recorded as a liability on our balance sheet as of December 31, 2009. 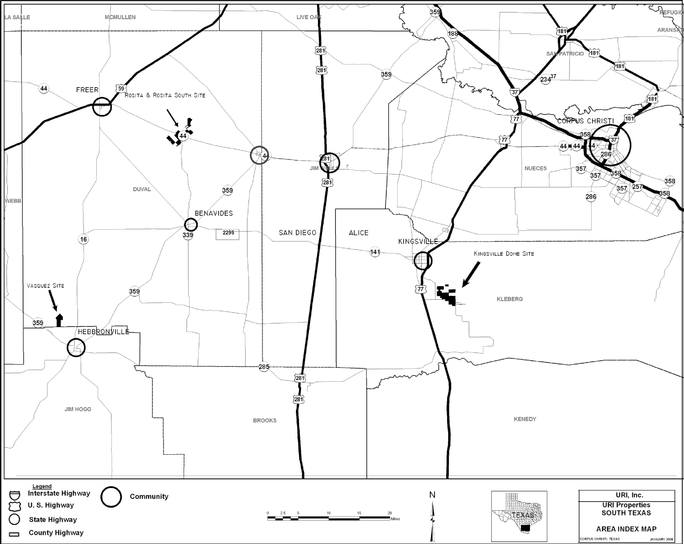 Under an agreement reached on March 1, 2004 with the Texas regulatory agencies and our bonding company, we agreed to fund ongoing groundwater restoration at the Kingsville Dome and Rosita mine sites at specified treatment rates, utilizing a portion of our cash flow from sales of uranium from the Vasquez site as a substitute for additional bonding. This agreement expired on August 31, 2007. As a result, the Company is now required to post adequate financial surety, and as of December 31, 2009 has posted letters of credit in the amount of $5.8 million, which are cash collateralized in full. These financial surety obligations are reviewed and revised periodically by the Texas regulators. In New Mexico, surety bonding will be required before commencement of mining and will be subject to annual review and revision by the United States Nuclear Regulatory Commission and the State of New Mexico or the USEPA. Water is essential to the ISR process. It is readily available in South Texas. In Texas, water is subject to capture, and we do not have to acquire water rights through a state administrative process. In New Mexico, water rights are administered through the New Mexico State Engineer and can be subject to Indian tribal jurisdictional claims. New water rights or changes in purpose or place of use or points of diversion of existing water rights, such as those in the San Juan and Gallup Basins where our properties are located, must be obtained by permit from the State Engineer. Applications may be approved subject to conditions that govern exercise of the water rights. Jurisdiction over water rights becomes an issue in New Mexico when an Indian nation, such as the Navajo Nation, objects to the State Engineers authority and claims tribal jurisdiction over Indian Country. This issue may result in litigation between the Indian nation and the state, which may delay action on water right applications, and can require applications to the appropriate Indian nation and continuing jurisdiction by the Indian nation over use of the water. The foregoing issues arise in connection with certain of our New Mexico properties. In New Mexico, we hold approved water rights to provide sufficient water to conduct mining at the Churchrock project and Section 24 for the Crownpoint project for the projected life of these mines. We also hold two unprotested senior water rights applications that, when approved, would provide sufficient water for future extensions of the Crownpoint project. A primary area of competition is in the identification and acquisition of properties with high prospects of potential producible reserves that are suitable for our size operation. We believe that we compete with multiple junior exploration companies for both properties as well as skilled personnel. The Company competes for markets for our uranium primarily based on price. We market uranium to utilities and commodity brokers and are in direct competition with supplies available from various sources worldwide. We believe we compete with approximately multiple operating companies in the mining and sale of uranium. Our Internet website address is www.uraniumresources.com. Our annual report on Form 10-K, quarterly reports on Form 10-Q, current reports of Form 8-K, and amendments to those reports filed or furnished pursuant to section 13(a) of 15(d) of the Exchange Act, are available free of charge through our website under the tab Investor Relations as soon as reasonably practicable after they are electronically filed with, or furnished to, the Securities and Exchange Commission. We also make available on our website copies of materials regarding our corporate governance policies and practices, including our Code of Ethics, Nominating Committee Charter, Audit Committee Charter and Compensation Committee Charter. You may also obtain a printed copy of the foregoing materials by sending written request to: Uranium Resources, Inc., 405 State Highway 121 Bypass, Building A, Suite 110, Lewisville, Texas 75067, Attention: Information Request or by calling 972.219.3330. The factors identified below are important factors (but not necessarily all of the important factors) that could cause actual results to differ materially from those expressed in any forward-looking statement made by, or on behalf of, the Company. Where any such forward-looking statement includes a statement of the assumptions or bases underlying such forward-looking statement, we caution that, while we believe such assumptions or bases to be reasonable and make them in good faith, assumed facts or bases almost always vary from actual results, and the differences between assumed facts or bases and actual results can be material, depending upon the circumstances. Where, in any forward-looking statement, the Company, or its management, expresses an expectation or belief as to the future results, such expectation or belief is expressed in good faith and believed to have a reasonable basis, but there can be no assurance that the statement of expectation or belief will result, or be achieved or accomplished. Taking into account the foregoing, the following are identified as important risk factors that could cause actual results to differ materially from those expressed in any forward-looking statement made by, or on behalf of, the Company. We are not producing uranium at this time, nor do we expect to begin production in the near future unless uranium prices recover to a profitable level. As a result, we currently have no sources of operating cash. If we cannot monetize certain existing Company assets, partner with another Company that has cash resources, find other means of generating revenue other than uranium production and/or have the ability to access additional sources of private or public capital we may not be able to remain in business. We will not commence production at our existing properties until uranium prices recover to a profitable level. Until uranium prices recover we will have no way to generate cash inflows unless we monetize certain Company assets or find other means to generate cash. In addition, our Vasquez project has been depleted of its economically recoverable reserves and our Rosita and Kingsville Dome projects have limited identified economically recoverable reserves. Our future uranium production, cash flow and income are dependent upon our ability to bring on new, as yet unidentified wellfields and to acquire and develop additional reserves. We can provide no assurance that our properties will be placed into production or that we will be able to continue to find, develop, acquire and finance additional reserves. We are presently out of compliance with the continuing listing requirements of the NASDAQ Global Market, the exchange on which our common stock is traded. If our stock is delisted from NASDAQ, a reliable trading market for our securities could cease to exist, the market price of our common stock could be negatively impacted and we could face difficulty raising additional capital. On January 10, 2010, the NASDAQ Stock Market, the exchange on which our common stock is traded, notified us that the bid price for our common stock closed below the minimum $1.00 per share for a period of 30 consecutive business days, which means that we fail to meet the requirements for continued listing set forth in Marketplace Rule 5550(a)(1). If we cannot regain compliance with the minimum bid requirements before July 7, 2010, NASDAQ may take steps to delist our common stock from the NASDAQ. Delisting would have an adverse effect on the liquidity of our common stock and, as a result, the market price for our common stock might decline. Delisting could also make it more difficult for us to raise additional capital. Our ability to function as an operating mining company will be dependent on our ability to mine our properties at a profit sufficient to finance further mining activities and for the acquisition and development of additional properties. The volatility of uranium prices makes long-range planning uncertain and raising capital difficult. In addition to ceasing all production, we have deferred all activities for delineation and development of new wellfields at our South Texas projects. This decision limits our ability to be immediately ready to begin production should uranium prices improve suddenly. Our ability to operate on a positive cash flow basis will be dependent on mining sufficient quantities of uranium at a profit sufficient to finance our operations and for the acquisition and development of additional mining properties. Any profit will necessarily be dependent upon, and affected by, the long and short term market prices of uranium, which are subject to significant fluctuation. Uranium prices have been and will continue to be affected by numerous factors beyond our control. These factors include the demand for nuclear power, political and economic conditions in uranium producing and consuming countries, uranium supply from secondary sources and uranium production levels and costs of production. A significant, sustained drop in uranium prices may make it impossible to operate our business at a level that will permit us to cover our fixed costs or to remain in operation. We face risks related to exploration and development, if warranted, on our properties. Our level of profitability, if any, in future years will depend to a great degree on uranium prices and whether any of our exploration stage properties can be brought into production. The exploration for and development of uranium deposits involves significant risks. It is impossible to ensure that the current and future exploration programs and/or feasibility studies on our existing properties will establish reserves. Whether a uranium ore body will be commercially viable depends on a number of factors, including, but not limited to: the particular attributes of the deposit, such as size, grade and proximity to infrastructure; uranium prices, which cannot be predicted and which have been highly volatile in the past; mining, processing and transportation costs; perceived levels of political risk and the willingness of lenders and investors to provide project financing; labor costs and possible labor strikes; and governmental regulations, including, without limitation, regulations relating to prices, taxes, royalties, land tenure, land use, importing and exporting materials, foreign exchange, environmental protection, employment, worker safety, transportation, and reclamation and closure obligations. Most exploration projects do not result in the discovery of commercially mineable deposits of uranium and there can be no assurance that any of our exploration stage properties will be commercially mineable or can be brought into production. The only market for uranium is nuclear power plants world-wide, and there are a limited number of customers. We are dependent on a limited number of electric utilities that buy uranium for nuclear power plants. Because of the limited market for uranium, a reduction in purchases of newly produced uranium by electric utilities for any reason (such as plant closings) would adversely affect the viability of our business. The price of alternative energy sources affects the demand for and price of uranium. The attractiveness of uranium as an alternative fuel to generate electricity may to some degree be dependent on the relative prices of oil, gas, coal and hydro-electricity and the possibility of developing other low cost sources for energy. If the price of alternative energy sources decrease or new low-cost alternative energy sources are developed, the demand for uranium could decrease, which may result in the decrease in the price of uranium. Public acceptance of nuclear energy is uncertain. Maintaining the demand for uranium at current levels and future growth in demand will depend upon acceptance of nuclear technology as a means of generating electricity. Lack of public acceptance of nuclear technology would adversely affect the demand for nuclear power and potentially increase the regulation of the nuclear power industry. The Navajo Nation ban on uranium mining in Indian Country encompasses approximately 84% of our in-place mineralized uranium material on our properties in New Mexico and will adversely affect our ability to mine unless the ban is overturned. In April 2005, the Navajo Nation Council passed the Diné Natural Resources Protection Act of 2005 prohibiting uranium mining and processing on any sites within Indian Country as defined under 18 U.S.C. § 1151. We believe that the ban is beyond the jurisdiction of the Navajo Nation. However, the ban may prevent us from developing and operating our properties located in Indian Country until the jurisdictional issue is resolved. In February 2007, the United States Environmental Protection Agency, or USEPA, determined that Section 8 of our Churchrock property was Indian Country and that the USEPA and not the state of New Mexico has the authority to issue the Underground Injection Control, or UIC, permits for Section 8 that are a precondition to mining. We appealed that decision to the United States Court of Appeals for the Tenth Circuit, which ruled 2 to 1 that Section 8 of the Churchrock property is Indian Country. The Company was granted an en banc review of the Tenth Circuits decision and oral arguments were presented to the Court on January 12, 2010. We are waiting for the Court to render a decision. 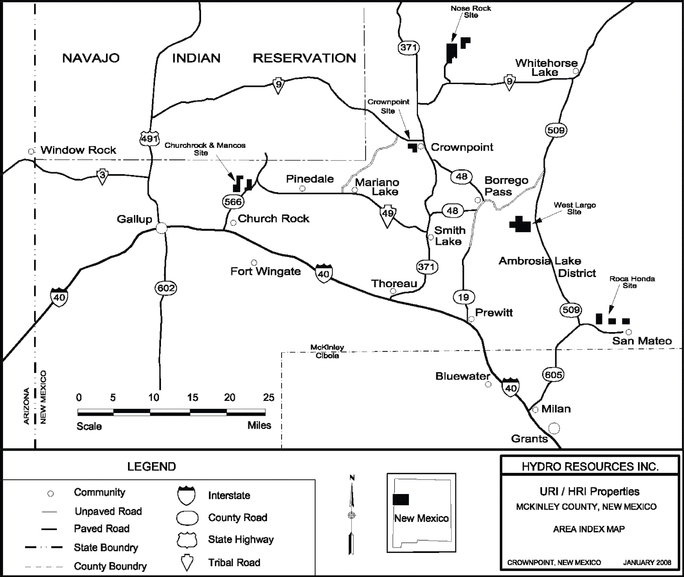 The expansive definition of Indian Country adopted by the USEPA may encompass properties owned by non-Indians within Navajo chapters in New Mexico. If that expansive definition prevails, as much as 84% of our in-place mineralized uranium materials in New Mexico could be deemed to be in Indian Country, which could subject these properties to the Navajo Nation ban on uranium mining. Our inability to mine our New Mexico properties could have a material adverse impact on our results of operations. We may not be able to mine a substantial portion of our uranium in New Mexico until a mill is built in New Mexico. A substantial portion of our uranium in New Mexico lends itself most readily to conventional mining methods and may not be able to be mined unless a mill is built in New Mexico. We have no immediate plans to build, nor are we aware of any third partys plan to build, a mill in New Mexico and there can be no guaranty that a mill will be built. In the event that a mill is not built a substantial portion of our uranium may not be able to be mined. Our inability to mine all or a portion of our uranium in New Mexico would have a material adverse effect on future operations. Itochu elected to terminate our Joint Venture with them for the development of the Churchrock Property and we do not have a committed source of financing for the development of our Churchrock Property. On December 5, 2006, HRI-Churchrock, Inc., a wholly owned subsidiary of the Company, entered into a joint venture with a wholly owned subsidiary of Itochu Corporation to develop jointly our Churchrock property in New Mexico. Under the terms of the joint venture, both parties had until April 2, 2007 to make a preliminary investment decision whether to move forward with the joint venture. The parties agreed to extend that date to March 2, 2009. On March 6, 2009, we received notification that Itochu had elected to terminate the Joint Venture. As a result, we no longer have a committed source of financing for the development of our Churchrock property. There can be no assurance that we will be able to obtain financing for this project. Our inability to develop the Churchrock property would have a material adverse effect on our future operations. Our operations are subject to environmental risks. We are required to comply with environmental protection laws and regulations and permitting requirements, and we anticipate that we will be required to continue to do so in the future. We have expended significant resources, both financial and managerial, to comply with environmental protection laws, regulations and permitting requirements and we anticipate that we will be required to continue to do so in the future. The material laws and regulations within the U.S. that the Company must comply with include the Atomic Energy Act, Uranium Mill Tailings Radiation Control Act of 1978, or UMTRCA, Clean Air Act, Clean Water Act, Safe Drinking Water Act, Federal Land Policy Management Act, National Park System Mining Regulations Act, and the State Mined Land Reclamation Acts or State Department of Environmental Quality regulations, as applicable. We are required to comply with the Atomic Energy Act, as amended by UMTRCA, by applying for and maintaining an operating license from the NRC and the state of Texas. Uranium operations must conform to the terms of such licenses, which include provisions for protection of human health and the environment from endangerment due to radioactive materials. The licenses encompass protective measures consistent with the Clean Air Act and the Clean Water Act. We intend to utilize specific employees and consultants in order to comply with and maintain our compliance with the above laws and regulations. Mining operations may be subject to other laws administered by the federal Environmental Protection Agency and other agencies. The uranium industry is subject not only to the worker health and safety and environmental risks associated with all mining businesses, but also to additional risks uniquely associated with uranium mining and milling. The possibility of more stringent regulations exists in the areas of worker health and safety, storage of hazardous materials, standards for heavy equipment used in mining or milling, the disposition of wastes, the decommissioning and reclamation of exploration, mining and in-situ sites, climate change and other environmental matters, each of which could have a material adverse effect on the cost or the viability of a particular project. preservation of certain lands. These regulations may require the acquisition of permits or other authorizations for certain activities. These laws and regulations may also limit or prohibit activities on certain lands. Compliance with more stringent laws and regulations, as well as potentially more vigorous enforcement policies or stricter interpretation of existing laws, may necessitate significant capital outlays, may materially affect our results of operations and business, or may cause material changes or delays in our intended activities. Our operations may require additional analysis in the future including environmental, cultural and social impact and other related studies. Certain activities require the submission and approval of environmental impact assessments. Environmental assessments of proposed projects carry a heightened degree of responsibility for companies and directors, officers, and employees. We cannot provide assurance that we will be able to obtain or maintain all necessary permits that may be required to continue our operation or our exploration of our properties or, if feasible, to commence development, construction or operation of mining facilities at such properties on terms which enable operations to be conducted at economically justifiable costs. If we are unable to obtain or maintain permits or water rights for development of our properties or otherwise fail to manage adequately future environmental issues, our operations could be materially and adversely affected. Because mineral exploration and development activities are inherently risky, we may be exposed to environmental liabilities and other dangers. If we are unable to maintain adequate insurance, or liabilities exceed the limits of our insurance policies, we may be unable to continue operations. The business of mineral exploration and extraction involves a high degree of risk. Few properties that are explored are ultimately developed into production. Unusual or unexpected formations, formation pressures, fires, power outages, labor disruptions, flooding, explosions, cave-ins, landslides and the inability to obtain suitable or adequate machinery, equipment or labor are other risks involved in extraction operations and the conduct of exploration programs. Previous mining operations may have caused environmental damage at certain of our properties. It may be difficult or impossible to assess the extent to which such damage was caused by us or by the activities of previous operators, in which case, any indemnities and exemptions from liability may be ineffective. If any of our properties are found to have commercial quantities of uranium, we would be subject to additional risks respecting any development and production activities. Although we carry liability insurance with respect to our mineral exploration operations, we may become subject to liability for damage to life and property, environmental damage, cave-ins or hazards against which we cannot insure or against which we may elect not to insure because of cost or other business reasons. In addition, the insurance industry is undergoing change and premiums are being increased. If we are unable to procure adequate insurance because of cost, unavailability or otherwise, we might be forced to cease operations. Our inability to obtain financial surety would threaten our ability to continue in business. Future bonding requirements to comply with federal and state environmental and remediation requirements and to secure necessary licenses and approvals will increase significantly when future development and production occurs at our sites in Texas and New Mexico. The amount of the bonding for each producing property is subject to annual review and revision by regulators. We expect that the issuer of the bonds will require us to provide cash collateral equal to the face amount of the bond to secure the obligation. In the event we are not able to raise, secure or generate sufficient funds necessary to satisfy these bonding requirements, we will be unable to develop our sites and bring them into production, which inability will have a material adverse impact on our business and may negatively affect our ability to continue to operate. Competition from better-capitalized companies affects prices and our ability to acquire properties and personnel. There is global competition for uranium properties, capital, customers and the employment and retention of qualified personnel. In the production and marketing of uranium, there are a number of producing entities, some of which are government controlled and all of which are significantly larger and better capitalized than we are. Many of these organizations also have substantially greater financial, technical, manufacturing and distribution resources than we have. Our uranium production also competes with uranium recovered from the de-enrichment of highly enriched uranium obtained from the dismantlement of United States and Russian nuclear weapons and imports to the United States of uranium from the former Soviet Union and from the sale of uranium inventory held by the United States Department of Energy. In addition, there are numerous entities in the market that compete with us for properties and are attempting to become licensed to operate ISR facilities. If we are unable to successfully compete for properties, capital, customers or employees or alternative uranium sources, it could have a materially adverse effect on our results of operations. Because we have limited capital, inherent mining risks pose a significant threat to us compared with our larger competitors. Because we have limited capital, we are unable to withstand significant losses that can result from inherent risks associated with mining, including environmental hazards, industrial accidents, flooding, interruptions due to weather conditions and other acts of nature which larger competitors could withstand. Such risks could result in damage to or destruction of our infrastructure and production facilities, as well as to adjacent properties, personal injury, environmental damage and processing and production delays, causing monetary losses and possible legal liability. We may need to obtain additional financing in order to implement our business plan, and the inability to obtain it could cause our business plan to fail. As of December 31, 2009, we had approximately $6.1 million in cash. We may require additional financing in order to complete our plan of operations. We may not be able to obtain all of the financing we require. Our ability to obtain additional financing is subject to a number of factors, including the market price of uranium, market conditions, investor acceptance of our business plan, and investor sentiment. These factors may make the timing, amount, terms and conditions of additional financing unattractive or unavailable to us. In recognition of current economic conditions and the planned shut-down of production, we have significantly reduced our spending, delayed or cancelled planned activities and substantially changed our current corporate structure. However, these actions may not be sufficient to offset the detrimental effects of the weak economy and cessation of production, which could result in material adverse effects on our business, revenues, operating results, and prospects. Our business could be harmed if we lose the services of our key personnel. Our business and mineral exploration programs depend upon our ability to employ the services of geologists, engineers and other experts. In operating our business and in order to continue our programs, we compete for the services of professionals with other mineral exploration companies and businesses. In addition, several entities have expressed an interest in hiring certain of our employees. Our ability to maintain and expand our business and continue our exploration programs may be impaired if we are unable to continue to employ or engage those parties currently providing services and expertise to us or identify and engage other qualified personnel to do so in their place. To retain key employees, we may face increased compensation costs, including potential new stock incentive grants and there can be no assurance that the incentive measures we implement will be successful in helping us retain our key personnel. Approximately 21.2% of our Common Stock is controlled by one record owner and management. Approximately 13.1% of our common stock is controlled by one significant stockholder. In addition, our directors and officers are the beneficial owners of approximately 8.1% of our common stock. This includes, with respect to both groups, shares that may be purchased upon the exercise of outstanding options. Such ownership by the Companys principal shareholders, executive officers and directors may have the effect of delaying, deferring, preventing or facilitating a sale of the Company or a business combination with a third party. The availability for sale of a large amount of shares may depress the market price of our Common Stock. As of December 31, 2009, 56,781,792 shares of our Common Stock were currently outstanding, all of which are registered or otherwise transferable. The availability for sale of a large amount of shares or conversion of the Companys outstanding warrants by any one or several shareholders may depress the market price of our Common Stock and impair our ability to raise additional capital through the public sale of our Common Stock. We have no arrangement with any of the holders of the foregoing shares to address the possible effect on the price of our Common Stock of the sale by them of their shares. Terms of subsequent financings may adversely impact our stockholders. In order to finance our working capital needs, we may have to raise funds through the issuance of equity or debt securities in the future. We currently have no authorized preferred stock. Depending on the type and the terms of any financing we pursue, stockholders rights and the value of their investment in our Common Stock could be reduced. For example, if we have to issue secured debt securities, the holders of the debt would have a claim to our assets that would be prior to the rights of stockholders until the debt is paid. Interest on these debt securities would increase costs and negatively impact operating results. If the issuance of new securities results in diminished rights to holders of our common stock, the market price of our common stock could be negatively impacted. Shareholders could be diluted if we were to use Common Stock to raise capital. As previously noted, we may need to seek additional capital in the future to satisfy our working capital requirements. This financing could involve one or more types of securities including common stock, convertible debt, preferred stock or warrants to acquire common or preferred stock. These securities could be issued at or below the then prevailing market price for our common stock. Any issuance of additional shares of our common stock could be dilutive to existing stockholders and could adversely affect the market price of our common stock. We currently control 3 major properties in the state of Texas. The Kingsville Dome, Rosita and Vasquez properties are shown in Figure No. 2.1 and are described below. The Property. 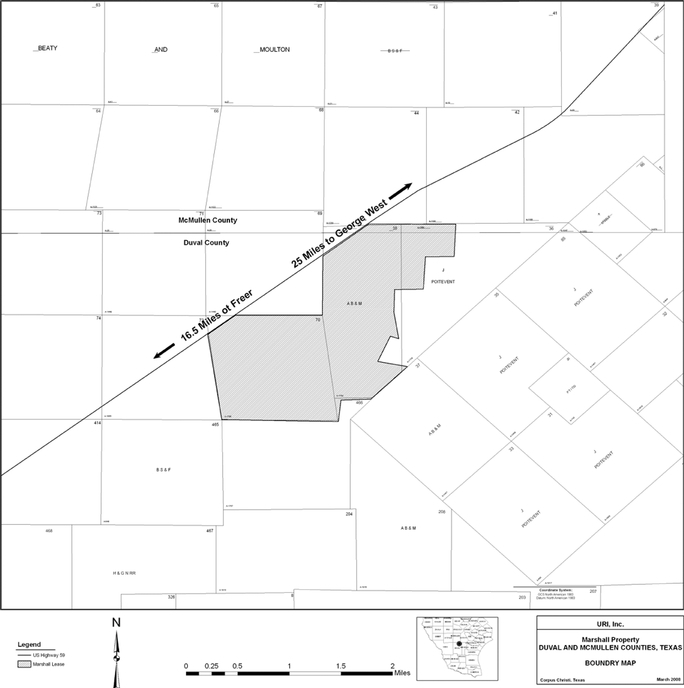 The Kingsville Dome property consists of mineral leases from private landowners on about 2,424 gross and 2,227 net acres located in central Kleberg County, Texas. The leases provide for royalties based upon a percentage of uranium sales of 6.25%. The leases have expiration dates ranging from 2000 to 2007, however we hold most of these leases by production; and with a few minor exceptions, all the leases contain clauses that permit us to extend the leases not held by production by payment of a per acre royalty ranging from $10 to $30. We have paid such royalties on all material acreage. Mineralization is found in the Goliad formation at depths of 600 to 750 feet. Production History. Initial production commenced in May 1988. From then until July 1999, we produced a total of 3.5 million pounds. Production was stopped in July 1999, because of depressed uranium prices. We resumed production at Kingsville Dome in April 2006 and produced 94,100 pounds of uranium in 2006; 338,100 pounds in 2007, 254,000 pounds in 2008 and 56,000 pounds in 2009. We made approximately $8.0 million in capital expenditures in 2007, $3.6 million in 2008 and $159,000 in 2009. Restoration and Reclamation. During 2009, we conducted restoration activities as required by the permits and licenses on this project spending approximately $963,000 on restoration activities. In 2008 and 2007, we spent approximately $349,000 and $595,000, respectively. Since we began our groundwater activities in 1998, we have processed and cleaned approximately 2.0 billion gallons of groundwater at the Kingsville Dome project. 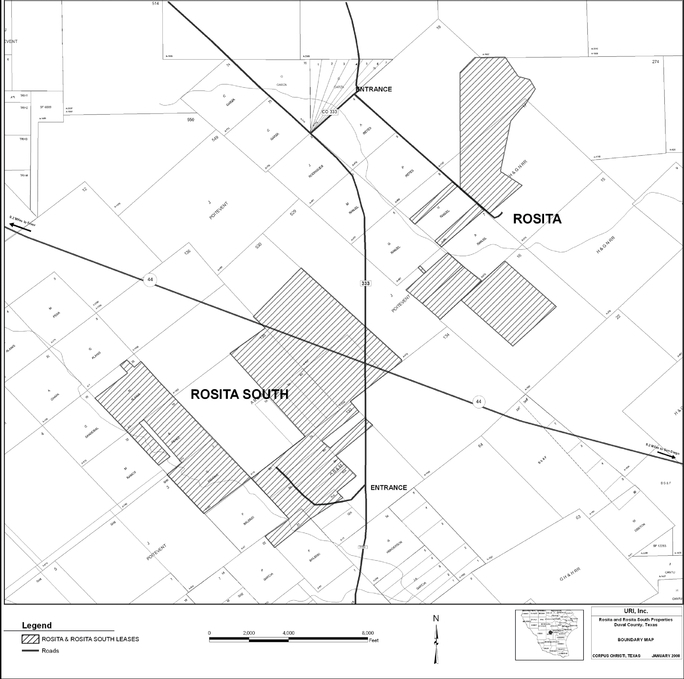 The Property: The Rosita property consists of mineral leases from private landowners on about 3,377 gross and net acres and the Rosita South property consists of mineral leases from private land owners on about 2,130 gross acres and 1,984 net acres located in north-central Duval County, Texas. The leases provide for sliding scale royalties based on a percentage of uranium sales. Royalty percentages on average increase from 6.25% up to 18.25% when uranium prices reach $80.00 per pound. The leases have expiration dates ranging from 2012 to 2015. We are holding these leases by payment of rental fees ranging from $10 to $30 per acre. Mineralization is found in the Goliad Formation at depths of 125 to 350 feet. Production History: Initial production commenced in 1990. From then until July 1999, URI produced a total of 2.64 million pounds. Production was stopped in July of 1990 because of depressed uranium prices. Production from a new wellfield at Rosita wellfield was begun in June 2008. However, technical difficulties that raised the cost of production coupled with a sharp drop in uranium prices led to the decision to shut-in this wellfield after 10,200 pounds were produced. Our capital expenditures were approximately $40,000, $4.5 million and $5.0 million in 2009, 2008 and 2007, respectively primarily for plant refurbishment and wellfield development. Restoration and Reclamation. We are conducting restoration and reclamation activities at this project and are currently in stabilization in our first two PAs. During 2009, our primary groundwater activity consisted of collecting groundwater samples throughout the year for stability testing. We spent approximately $247,000, $465,000 and $820,000 on restoration activities in 2009, 2008 and 2007, respectively. Since we began our groundwater activities in 2000, we have processed and cleaned approximately 1.3 billion gallons of groundwater at the Rosita project. Permitting Status: A radioactive material license and an underground injection control permit have been issued for the Rosita property. The underground injection control permit is being amended to include the Rosita South property. Production could resume in areas already included in existing Production Area Authorizations. As new areas are proposed for production, additional authorizations under the permit will be required. The Property. We have a mineral lease on 872 gross and net acres located in southwestern Duval County, in South Texas. The primary term expired in February 2008; however, we held the lease by production and are currently in restoration. The lease provides for royalties based upon 6.25% of uranium sales below $25.00 per pound and royalty rate increases on a sliding scale up to 10.25% for uranium sales occurring at or above $40.00 per pound. Mineralization is found in the Oakville formation at depths of 200 to 250 feet. Production History. We commenced production from this property in October 2004. Our capital expenditures in 2009 were approximately $194,000. We had approximately $355,000 in capital expenditures at Vasquez and produced 36,600 pounds of uranium in 2008. We had approximately $1.3 million in capital expenditures at Vasquez and produced 78,600 pounds of uranium in 2007. Restoration and Reclamation. We are conducting ongoing restoration and reclamation activities at this project and have spent $591,000, $224,000 and $33,000 in 2009, 2008 and 2007, respectively for such activities. Since the commencement of groundwater restoration activities at the end of 2007, we have treated approximately 161 million gallons of groundwater. Permitting Status. All of the required permits for this property have been received. Marshall Exploration Property (figure 2.6). The Marshall Property is a Goliad and Oakville prospect consisting of 1953 gross and net acres. It is located in Duval and McMullen counties, Texas. During 2008 we drilled 280 exploration holes and discovered significant mineralization. Further evaluation will need to be conducted to determine if this property can be mined using ISR methods. The Property. The Churchrock project encompasses about 2,200 gross and net acres. The properties are located in McKinley County, New Mexico and consist of three parcels, known as Section 8, Section 17 and Mancos. None of these parcels lies within the area generally recognized as constituting the Navajo Reservation. However, Section 8 has been designated by the USEPA as Indian Country. See, Item 3. Legal Proceedings. Access to the Churchrock property is via State Highway 566 and access to Mancos is via 4-wheel drive ranch roads west of State Highway 566. We own the mineral estate in fee for the NE 1/4 and the SW 1/4 of the NW 1/4 of Section 17, T16N, R16W. In Section 8, T16N, R16W, we own the SE 1/4 in fee and hold the minerals in the rest of the section with 26 unpatented federal mining claims (UNC1A thru UNC 26). For the Mancos Property, we own the minerals in Section 13, T16N, R17W, in fee, the minerals in the NW 1/4 of Section 7, T16N, R16W, in fee and hold the minerals in the E 1/2 of Section 12, T16N, R17W, with 20 unpatented federal mining claims (KP1A thru KP5A, KP19, KP36, 121617-14A thru 121617-18A, 121617-20A thru 121617-23A and 121617-32A thru 121617-35A). The federal unpatented mining claims are all held through the payment of a $125.00 assessment fee each year on each claim. Mineralization occurs in the Westwater Member of the Morrison Formation at depths of 800 to 1700 feet. The surface estate on Section 17, Mancos Section 13 and Mancos Section 7 is owned by the United States Government and held in trust for the Navajo Nation. On those sections we have royalty obligations ranging from 5% to 61/4% and a 2% overriding royalty obligation to the Navajo Nation for surface use agreements. The total royalties on Section 8 depend on the sales price of uranium. Aggregate royalties are potentially as much as 39.25% at the current price of uranium. Development Plan. We anticipate that Churchrock will be the first of our New Mexico properties we will develop. We spent about $219,000, $421,000 and $504,000 in 2009, 2008 and 2007, respectively, for permitting activities and land holding costs. In December 2006, we entered into a joint venture with Itochu to jointly develop this property and in March 2009 the joint venture was terminated (see BusinessJoint Venture for Churchrock Property). Water Rights. The State Engineer approved our water rights application in October 1999 and granted us sufficient water rights for the life of Churchrock. Permitting Status. We have the radioactive material license for Section 8. This license is subject to the continuing proceedings described under Legal Proceedings. With respect to the UIC permits, see Legal Proceedings. We do not plan to pursue permits for Mancos at this time. The Property. The Crownpoint properties are located in the San Juan Basin, 22 miles northeast of our Churchrock deposits and 35 miles northeast of Gallup, New Mexico, adjacent to the town of Crownpoint, New Mexico. The properties consist of 619 gross and 521.8 net acres. We hold the minerals in the NW 1/4 of Section 9, T17N, R13W with 9 unpatented federal mining claims (CP-1 thru CP9) and the minerals in the SW 1/4 of Section 24, T17N, R13W with 10 unpatented federal mining claims (CP-10 thru CP-19). In the SE 1/4 of Section 24, T17N, R13W we own in fee a 40% interest in the minerals on approximately 139 acres and hold 100% of the minerals on 20 additional acres with two unpatented federal mining claims (Consol I and Consol II). In the NE 1/4 of Section 25, T17N, R13W we hold the minerals with eight unpatented federal mining claims (Hydro-1 thru Hydro-8). The federal unpatented mining claims are held through the payment of a $140.00 assessment fee each year on each claim. Access is via paved road from State Highway 371, through the town of Crownpoint to Church Road to the main gate of the property. Mineralization is found in the Westwater Member of the Morrison Formation at a depth of from 2,100 to 2,300 feet. Three pilot shafts were commenced on the property in the early 1980s but were never completed. Surface facilities dating from those activities including buildings and their associated electrical/water infrastructure are still in-place and are currently used as offices and storage facilities. Development Plan. We spent about $3,000, $127,000 and $164,000 in 2009, 2008 and 2007, respectively, for permitting activities and land holding costs. Water Rights. We have three pending applications for appropriations of water, which give us the first three positions in line on the hearings list for the San Juan Basin. Certain of the water rights may involve a claim of jurisdiction by the Navajo Nation. Permitting Status. See Legal Proceedings for a discussion of the radioactive material license for Crownpoint. 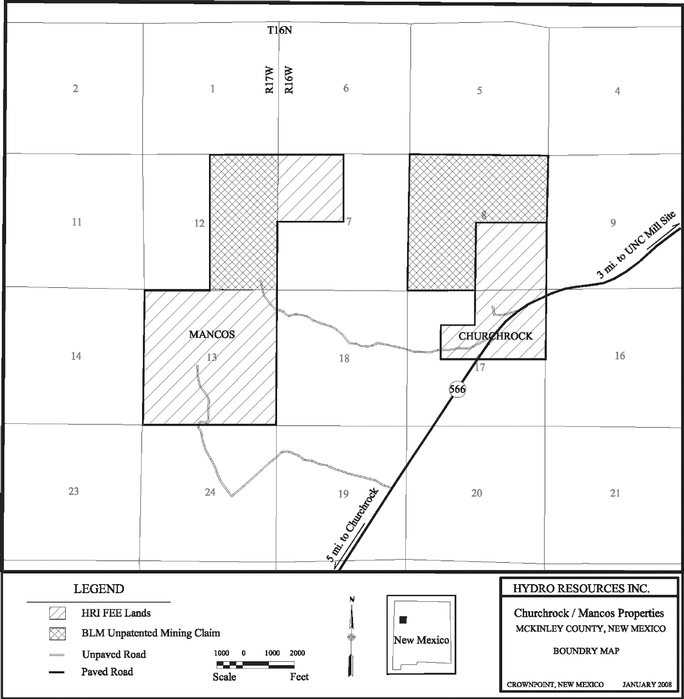 The surface estate on Section 19 and 29 is owned by the United States Government and held in trust for the Navajo Nation and may be subject to the same jurisdictional dispute with respect to the UIC permit as for Section 8 and 17 in Churchrock. The Nose Rock property consists of approximately 6,400 acres and is located about 12 miles northeast of Crownpoint, New Mexico. The minerals are held in fee on Sections 10, 11, 15, 17, 18, 19, 20, 29, 30 and 31 all in T19N, R11W. Access to the property is via a 41/2 mile private paved road north of Tribal Road 9. The property was developed by Philips Uranium Corporation in the early 1980s and includes two circular concrete-lined shafts that have been completed to a depth of 3,300 feet. Both shafts have been plugged at surface and just above the Westwater. There is no usable surface infrastructure on site. Mineralization occurs in the Westwater Member of the Morrison Formation. 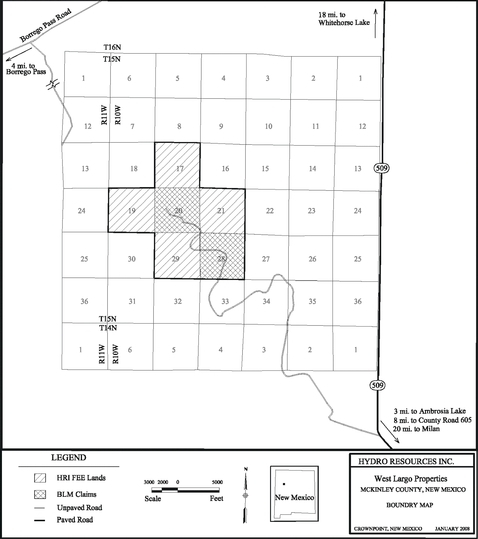 The West Largo property is comprised of six contiguous sections of land located in McKinley County, New Mexico about 21 miles north of the town of Milan, New Mexico and about three miles west of State Highway 509. Access is via a nine-mile 4-wheel drive road from State Highway 509. The minerals on sections 17, 19, 21 and 29 T15N, R10W are held in fee and the minerals on sections 20 and 28 T15N, R10W are held by 75 unpatented federal mining claims (ID21 thru ID91 and ID95 thru ID98). The federal unpatented mining claims are held through the payment of a $125.00 assessment fee each year on each claim. Mineralization occurs in the Westwater Member of the Morrison Formation at depths ranging from 2,000 to 2,750 feet depending on surface topography. Over 1,000 drill holes were used to define the mineralization in the late 1970s and early 1980s. Other than this exploration drilling, there has been no development on this property. The Roca Honda property is comprised of four sections of land totaling approximately 2,560 acres located about 4 miles northwest of the town of San Mateo in McKinley County, New Mexico. Sections 13, 15 and 17, T13N, R8W are held in fee and Section 8, T13N, R8W is held by 36 unpatented federal mining claims (Roca Honda 55 thru Roca Honda 63, Roca Honda 82 thru Roca Honda 90, Roca Honda 109 thru 117 and Roca Honda 136 thru Roca Honda 144). The federal unpatented mining claims are held through the payment of a $125.00 assessment for each year on each claim. The property is accessed over various 4-wheel drive ranch roads north of State Highway 605. Mineralization occurs in the Westwater Member of the Morrison Formation at depths ranging from 1,700 on Section 17 to over 3,300 feet in Section 13. In the late 1970s and early 1980s, various operators drilled 620 exploration holes on the property. In the late 1980s, Kerr-McGee sank a shaft to a depth of 1,475 feet on Section 17 to develop the property, then known as the Lee Mine. The shaft was stopped short of the ore zone and the mine closed down when uranium prices fell in 1983. There is no useable infrastructure on surface. Potential ISR and OSL areas (Figures 2.13 & 2.14). Several areas in T13N R 9 W and T14 N R 10W are being considered for early application of ISR methods (Sections 13 and 17 of T13N R9W and Sections 5 and 27 of T14 N R 10W). In November of 2008, we received a permit to drill up to 10 holes for the purpose of extracting core to evaluate the suitability of the property for ISR extraction. All land described is owned in fee. Two other sections in T14N R10W (Sections 23 and 25) have been the site of extensive development and mining in the past and could provide excellent targets for the application of Old Stope Leaching operations. Mineral on these two sections is owned in fee. Our property is covered by various types of insurance including property and casualty, liability and umbrella coverage. We have not experienced any material uninsured or under insured losses related to our properties in the past and believe that sufficient insurance coverage is in place. We have completed production and groundwater restoration on our Benavides and Longoria projects in South Texas. We completed the final stages of surface reclamation on these projects and received full and final release for these sites in 1999. Mining Act. If more remediation work is required, we believe it would not involve material expenditures as required by the New Mexico Energy Minerals and Natural Resources Department regulation. In January 2008 the Navajo Nation Environmental Protection Agency (NNEPA) notified the Company of their analysis that indicated potentially uranium contaminated materials present on the Churchrock Section 17 mine site. 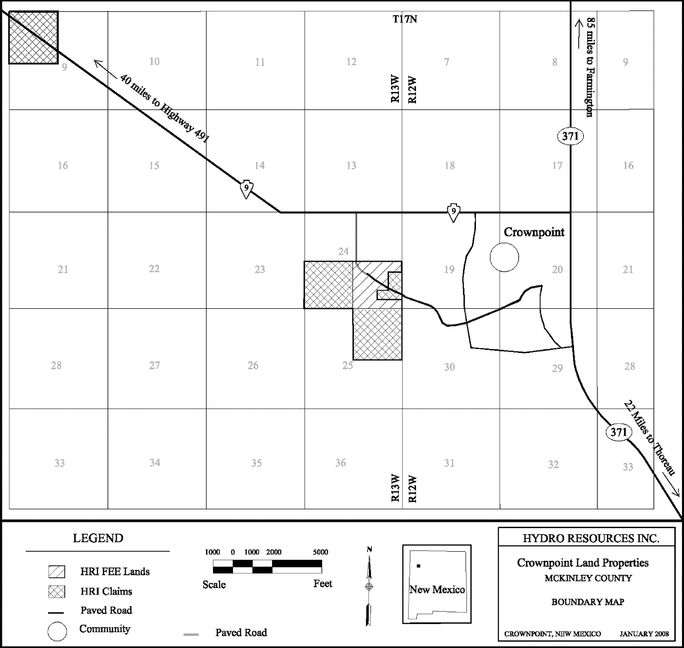 In response, the Company has performed a comprehensive characterization of the Churchrock Site at Section 17 and lands adjacent to the site area and completed the field work during the spring/summer of 2009. This study was completed in September 2009 and we believe that any off-site mine-related impacts at Section 17 and adjacent lands are minor. The jurisdiction of the Navajo Nation to require additional remediation at the Section 17 site, and their criteria for further remediation, are unknown. See Legal Proceedings for a description of the status of the Navajo EPA letter and UNC Demand for Indemnity in New Mexico. In the State of New Mexico, uranium recovery by ISR technology requires a combined source and 11e. (2) byproduct material (uranium recovery) license issued by the United States Nuclear Regulatory Commission (the NRC or the Commission). We applied for one license covering the properties located in both the Churchrock and Crownpoint districts collectively known as the Crownpoint Uranium Project (CUP). The Commission issued a uranium recovery license for the CUP in January 1998 that allowed licensed ISR operations to begin in the Churchrock district. In mid-1998, the Commission determined that certain interested stakeholders who requested an NRC administrative hearing had standing to raise certain objections to the NRC license. A panel of administrative law judges (NRCs Atomic Safety and Licensing Board (hereinafter Licensing Board)) conducted an administrative hearing during 1999. The Licensing Board upheld the Churchrock Section 8 portion of the NRC license and granted our request to defer any dispute on the remaining CUP properties until we make a decision whether to mine these other properties. The Licensing Boards ruling was then appealed to the full Commission. 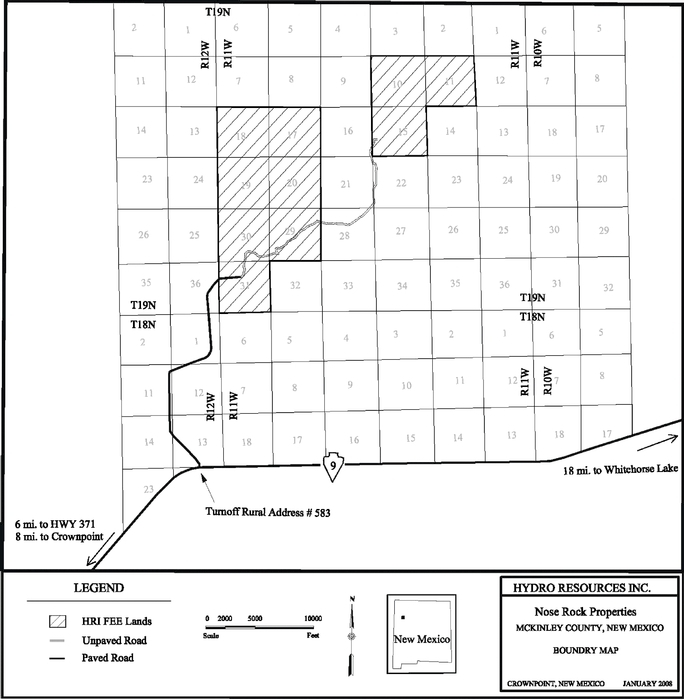 On January 31, 2000, the Commission issued an order concurring with the technical, substantive, and legal findings of the Licensing Board, but the Commission also determined that we were required to submit restoration action plans (RAP) for each CUP project site and that we must proceed with the hearing process for the other New Mexico properties beyond the Churchrock Section 8 project site (i.e. Churchrock Section 17, Unit 1 and Crownpoint). Subsequently, the NRC administrative hearing was held in abeyance until 2004, pursuant to NRC-supervised settlement negotiations between the parties. In February 2004, the Licensing Board issued an order, which concluded that we must make three specific changes to our submitted RAP for Churchrock Section 8 in order to commence uranium recovery operations at Churchrock Section 8. The Commission accepted our petition for review on two of the three issues and subsequently issued an order overruling the Licensing Board on these issues. Then, the parties agreed to truncate the number and scope of the issues remaining for consideration for the remaining three CUP project sites. Since then, the Licensing Board and the full Commission has endorsed our NRC license and its requirements for the entire CUP. Intervenors appealed the Commissions final approved action to the United States Court of Appeals for the Tenth Circuit. On March 8, 2010 the Tenth Circuit rejected the petition and affirmed the action of the Commission in all respects. With this decision, the petitioners are permitted to request that the Tenth Circuit rehear the case en banc or to petition the United States Supreme Court for a writ of certiorari to hear the case. Country adopted by the USEPA may encompass properties owned by non-Indians within Navajo chapters in New Mexico. If that expansive definition prevails, as much as 84% of our in-place mineralized uranium materials in New Mexico could be deemed to be in Indian Country, which could subject these properties to the Navajo Nation ban on uranium mining. We appealed that decision to the United States Court of Appeals for the Tenth Circuit. On April 17, 2009, a three-judge panel of the Tenth Circuit affirmed the USEPA decision and held that Section 8 of URIs Churchrock property (owned in fee by the Companys subsidiary Hydro Resources, Inc.) is Indian Country. One of the members of the panel dissented. The Company petitioned for and was granted an en banc review of the Tenth Circuit panels decision. Oral arguments were presented to the Court on January 12, 2010 and we are waiting for the Court to render a decision. In March 2004, the Company entered into the Groundwater Restoration Performance Agreement (GRPA), with the Texas Department of Health (TDH), later renamed the Texas Department of State Health Services (DSHS), the Texas Commission on Environmental Quality (TCEQ) and United States Fidelity and Guaranty Insurance Company as a means of funding the Companys ongoing groundwater restoration at the Kingsville Dome and Rosita mine sites at specified treatment rates, utilizing a portion of the Companys cash flow from sales of uranium from the Vasquez site as a substitute for additional bonding. Although Kleberg County and an ad hoc citizen group brought suit in April 2004 to challenge the GRPA, Kleberg County settled with the Company and withdrew its support and funding of the suit in December 2004. In June 2007, DSHS regulatory authority over uranium recovery operations, including its oversight of groundwater restoration bonds posted for uranium mining operations was transferred to TCEQ; and, on August 31, 2007, the GRPA expired according to its terms. The citizen group has taken no further action to pursue the suit. In February 2007, Kleberg County, Texas adopted a resolution alleging violations of its December 2004 Settlement Agreement with the Company and authorizing outside counsel to bring suit against the Company to force it to cease mineral production unless the Company promptly resolved the matter to the Countys satisfaction. 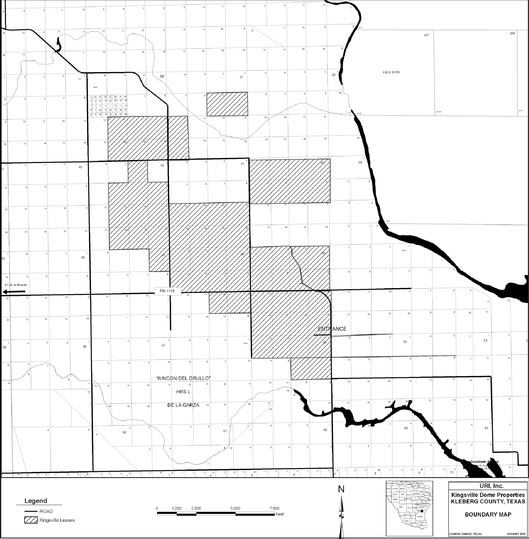 The County disputes the Companys interpretation of the December 2004 Settlement Agreement as to the level of groundwater restoration the Company agreed to achieve in Kingsville Dome Production Areas 1 and 2. Seeking to resolve these issues amicably, the Company elected to defer briefly the startup of production in Production Area 3, however, when the negotiations failed, the Company notified the County of its intent to resume production in Production Area 3. The Company believes it is in full compliance and engaged in a mediation of this dispute. On September 28, 2007, after negotiations had stalled but production continued, the Company filed suit against the County in the 105th Judicial District Court, Kleberg County, Texas for declaratory relief interpreting the Settlement Agreement and for recovery of the Companys legal fees and costs of the suit. The County answered the suit with a general denial but did not assert any counterclaim against the Company until May 28, 2009, when the County filed its First Amended Answer and Counterclaims. Although production had been completed at the mine by that time, the Countys amended pleading presents seven counterclaims based on the Companys alleged violations of the December, 2004 Settlement Agreement. By way of relief, the Countys Amended Answer and Counterclaims seeks declarations that the Company violated various Settlement Agreement provisions, asks for injunctive relief ordering the Company to cure various alleged violations of various Settlement Agreement provisions, and asks that the County be awarded its legal fees and costs of suit. The Company responded to the Countys assertion of counterclaims by commencing discovery in the case in July, 2009; and, the County responded by making discovery requests against the Company in December, 2009. The Company believes its own claims are well supported in fact and the law and that each of the Countys various claims is either factually or legally deficient or both. The Company believes that if the case should go to trial, it has a reasonable prospect of prevailing in its claims for declaratory relief and its claims for recovery of its attorneys fees and costs of suit. The Company will defend itself vigorously. After an August 2005 hearing, the Texas Commission on Environmental Quality (TCEQ) voted unanimously February 22, 2006 to renew the Companys disposal well permits, WDW-247 and WDW-248, and to issue Kingsville Dome Production Area Authorization 3 (PA 3). A citizens group and a Ms. Garcia filed in the 201st Judicial District Court, Travis County, Texas for judicial review of the TCEQ action in June 2006. The Texas Attorney General answered in defense of TCEQ and the Company intervened to defend the TCEQs action granting the permit renewals and production area authorization. The two cases have been consolidated; a judge has been assigned; and, in June 2007, the TCEQ submitted the administrative record to the court for review. In June 2007 an attorney claiming to have been newly engaged by a plaintiff, Ms. Garcia, notified all parties that Garcia wished to withdraw from the litigation and requested that no further action be taken and that her action be dismissed. On June 27, 2007, Garcias original counsel moved to appoint a guardian or representative for Ms. Garcia. The Company challenged the sufficiency of the request for appointment of a guardian or representative for Ms. Garcia; and Ms. Garcias original counsel set his motion for hearing in August 2007. Before the hearing date, original counsel for Ms. Garcia, tentatively rescheduled the hearing for October 24, 2007 and then canceled that hearing date. No further action on the matter has been scheduled; and mining in Production Area 3 and the rest of the Companys Kingsville Dome mines has ceased, leaving the entire mine site in the process of groundwater restoration.. The permits and production area authorization issued by TCEQ remain effective until and unless overturned by a reviewing Court; and, the Company believes the TCEQ action issuing the permits and production area authorization is well-founded and will be affirmed if the suit for judicial review is considered on its merits rather than being dismissed for want of prosecution. By letter dated January 23, 2008, the Navajo Nation Environmental Protection Agency (NNEPA) sent a document dated September 2007 titled Radiological Scoping Survey Summary Report for the Old Churchrock Mine Site (Survey Report) to Hydro Resources Inc (HRI) and United Nuclear Corporation and General Electric (UNC/GE). The Survey Report was reportedly prepared in response to a claim by NNEPA against HRI and UNC/GE for potential liability for uranium contaminated materials present on HRIs Churchrock Mine Site. NNEPA requested HRI and UNC/GE to undertake a comprehensive and detailed characterization of HRIs Churchrock Mine Site and adjacent lease areas, as recommended in the Survey Report. By letter dated January 29, 2008, UNC and GE, pursuant to a certain Supplemental Purchase Agreement and Guarantee, demanded that HRI and the Company defend and indemnify it for all loss, cost, expense, liabilities and obligations that have been or will be incurred or sustained by GE and UNC with respect to the request asserted by NNEPA. In response HRI/URI has committed with UNC and GE to perform a site assessment at its expense of the Old Churchrock Site for potential contamination from historic mining. In the event that a governmental authority issues a formal Administrative Order or files a lawsuit, the Company and UNC will be considered to have reserved their respective rights and defenses to the indemnity claims, and will immediately seek and attempt to resolve, in good faith, any areas of dispute which may exist at that time. 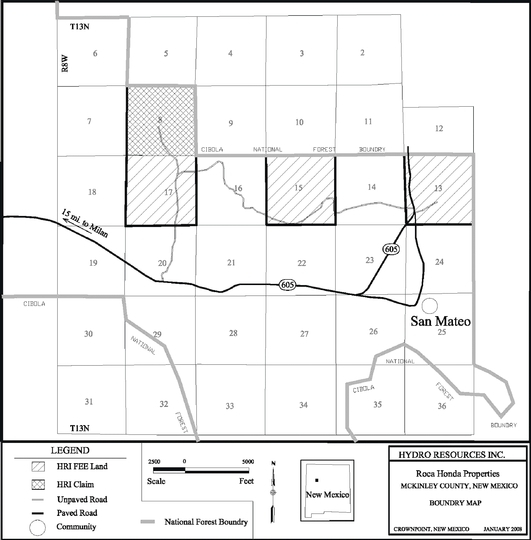 In June 2008 a suit for declaratory judgment titled, Saenz v. URI Inc., was filed in the 105th Judicial District Court, Kleberg County, Texas by the owners of the mineral estate of property in Kleberg County, Texas leased to the Company, seeking a declaratory judgment that a certain lease is limited to one specific lot only and does not encompass other adjacent lands. The Company has a lease on the adjacent lands from the same mineral owners and has produced over 340,000 pounds of uranium from those lands in 2007 and 2008. The Company entered a general denial of the claims. On September 24, 2008 the mineral owners amended their suit to include a declaration that both of the leases held by the Company are not valid. The Company has entered a general denial and other specific defenses to the amended complaint. The Company has produced uranium from both leases. On November 5, 2008, the Company engaged in mediation with the plaintiffs but was unable to resolve the matter. The Plaintiffs filed a Motion for Summary Judgment alleging that the leases terminated prior to any production occurring. The Court denied the motion. A trial date has been set for August 2, 2010. The Company will defend the case vigorously. While the Company believes that each of the leases is valid, counsel to the Company is unable to predict the outcome of the litigation. A determination of the invalidity of the lease on the adjacent lands on which the Company has previously produced uranium could have a material adverse effect on the Companys financial condition. On July 13, 2007, an employee of a drilling contractor engaged by the Company was killed when the drill rig on which he was making repairs backed over him on lands owned by the Company. At the time of the incident, the contractor and the decedent were not engaged in drilling activities, rather they were performing maintenance to the drilling rig. Decedents heirs filed claims against the drilling contractor and the Company in the 105th Judicial District Court, Kleberg County, Texas asserting claims of negligence. Our insurance carrier defended and resolved the matter on our behalf with no additional settlement costs incurred by the Company. The Company is subject to periodic inspection by certain regulatory agencies for the purpose of determining compliance by the Company with the conditions of its licenses. In the ordinary course of business, minor violations may occur; however, these are not expected to result in material expenditures or have any other material adverse effect on the Company. A claim is a 20 acre tract of land, the right to mine of which is held under the federal General Mining Law of 1872 and applicable local laws. A product from a uranium mining and milling facility, which is commonly referred to as uranium concentrate or U3O8. A process whereby uranium concentrates are converted into forms suitable for use as fuel in commercial nuclear reactors. Cut-off grade is determined by the following formula parameters: estimates over the relevant period of mining costs, ore treatment costs, general and administrative costs, refining costs, royalty expenses, process and refining recovery rates and uranium prices. Total acres under which we have mineral rights and can mine for uranium. A term derived from jurisdictional determinations in criminal law enforcement proceedings under 18 U.S.C. § 1151 and understood to encompass territory situated within Indian reservations, land owned by Indian allottees and land within a dependent Indian community. Groundwater fortified with oxygen and other solubilizing agents is pumped into a permeable ore body causing the uranium contained in the ore to dissolve. The resulting solution is pumped to the surface. The fluid-bearing uranium is then circulated to an ion exchange column on the surface where uranium is extracted from the fluid onto resin beads. The fluid is then reinjected into the ore body. When the ion exchange columns resin beads are loaded with uranium, they are removed and flushed with a salt-water solution, which strips the uranium from the beads. This leaves the uranium in slurry, which is then dried and packaged for shipment as uranium powder, or yellowcake. A mineralized body which has been delineated by appropriately spaced drilling and/or underground sampling to support a sufficient tonnage and average grade. Such a deposit does not qualify as a reserve, until a comprehensive evaluation based upon unit cost, grade, recoveries, and other material factors conclude legal and economic feasibility. 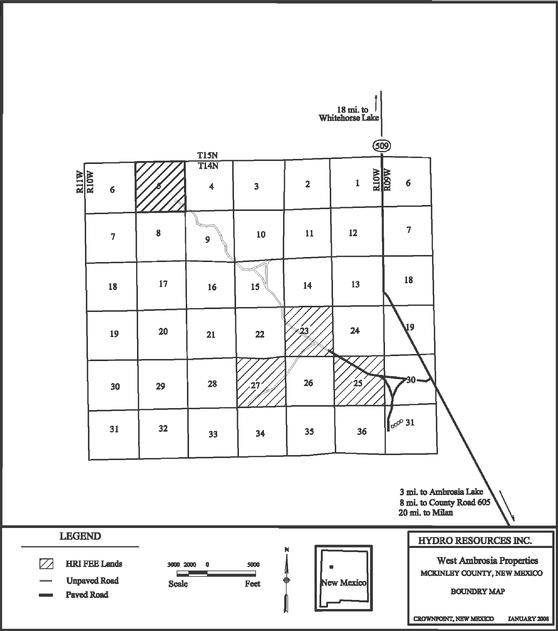 Actual acres under lease which may differ from gross acres when fractional mineral interests are not leased. Old stope leaching involves the pumping of ground water, through stopes, drifts, and other flooded underground mine workings of previously conventionally mined areas to remove the residual and soluble post mining uranium values. The resulting uranium-bearing ground water is pumped to the surface for uranium removal and then is re-circulated directly into the mine workings or into injection wells that are completed in or near to the workings. This re-circulation of the same ground water is repeated, until the residual uranium in the old underground mine is depleted. Naturally occurring material from which a mineral or minerals of economic value can be extracted at a reasonable profit. Reserves for which (a) quantity is computed from dimensions revealed in outcrops, trenches, workings or drill holes; grade and/or quality are computed from the results of detailed sampling and (b) the sites for inspection, sampling and measurement are spaced so closely and the geologic character is so well defined that size, shape, depth and mineral content of reserves are well-established. Reclamation involves the returning of the surface area of the mining and wellfield operating areas to a condition similar to pre-mining. Reserves that are either proven or probable, are physically minable and can be profitably recovered under conditions specified at the time of the appraisal, based on a positive feasibility study. The calculation of minable reserves is adjusted for potential mining recovery and dilution. That part of a mineral deposit which could be economically and legally extracted or produced at the time of the reserve determination. Restoration involves returning an aquifer to a condition consistent with our pre-mining use. The restoration of wellfield can be accomplished by flushing the ore zone with native ground water and/or using reverse osmosis to remove ions to provide clean water for reinjection to flush the ore zone. The configuration of sedimentary uranium ore bodies as they appear within the host sand. A term that depicts an elongate uranium ore mass that is C shaped. A term that refers to ceasing production or the absence of production. A lease clause permitting the extension of a lease not held by production by payment of a per acre royalty. The price at which uranium may be purchased for delivery within one year. A bond, letter of credit, or financial guarantee posted by a party in favor of a beneficiary to ensure the performance of its or another partys obligations, e.g., reclamation bonds, workers compensation bond, or guarantees of debt instruments. Waste material from a mineral processing mill after the metals and minerals of a commercial nature have been extracted; or that portion of the ore which remains after the valuable minerals have been extracted. Triuranium octoxide equivalent contained in uranium concentrates, referred to as uranium concentrate. Barren rock in a mine, or uranium in a rock formation that is too low in grade to be mined and milled at a profit. Uranium in powder form, the end-result of the ISR process. Since April 12, 2007, our common stock has been listed on the NASDAQ Global Market under the symbol URRE. Between April 11, 2007 and October 15, 2004, our shares were quoted on the Over the Counter Bulletin Board (OTCBB) and we were dually quoted on both the OTCBB and the Pink Sheets during those dates. On January 10, 2010, the Company received notification from The NASDAQ Stock Market (NASDAQ) that for 30 consecutive business days the bid price for the Companys common stock has closed below the minimum $1.00 per share as required by Marketplace Rule 5550(a)(1) for continued listing on the NASDAQ Global Market. In accordance with Marketplace Rule 5810(c)(3)(A), the Company will regain compliance with the minimum bid requirement if at any time before July 7, 2010 (180 calendar days), the bid price of the Companys common stock closes at $1.00 per share or above for a minimum of 10 consecutive business days. In the event the Company does not regain compliance with the minimum bid price rule by July 7, 2010, NASDAQ will provide the Company with written notification that its common stock is subject to delisting from the NASDAQ Global Market. At that time, pursuant to Marketplace Rule 5810(c)(3)(A), the Company may be eligible for an additional grace period of 180 calendar days if it meets all initial listing requirements, with the exception of the bid price, for the NASDAQ Capital Market and submits an application to the NASDAQ Capital Market. Alternatively, the Company may appeal NASDAQs determination to delist its common stock at that time. The Company intends to actively monitor the closing bid price of its common stock prior to July 7, 2010 and will evaluate available options to resolve the deficiency and regain compliance with the Minimum Bid Price Requirement under the NASDAQ Listing Rules. As of December 31, 2009, 56,781,792 shares of our common stock were outstanding. On that date, there were 126 holders of record. We have never paid any cash or other dividends on our common stock, and we do not anticipate paying dividends for the foreseeable future. The following table sets forth information as of December 31, 2009 regarding equity compensation to the Companys employees, officers and directors under equity compensation plans. The following chart compares the yearly changes in total stockholder return on the Companys common stock against two other measures of performance. The comparison is on a cumulative basis for the Companys last five fiscal years. The three other performance measures are the Russell 2000 index, a new peer group consisting of DenisonDNN, UranerzURZ, Uranium EnergyUEC and Strathmore Minerals STHJF and an old peer group consisting of CamecoCCJ, DenisonDNN, UranerzURZ, and Uranium EnergyUEC. In each case, we assumed an initial investment of $100 on December 31, 2004 and reinvestment of all dividends. Dates on the following chart represent the last trading day of the indicated fiscal year. The following tables provide selected financial and operating data for each of the fiscal years in the five-year period ended December 31, 2009. The selected financial and operating data set forth below should be read in conjunction with, and are qualified in their entirety by reference to, the section entitled Managements Discussion and Analysis of Financial Condition and Results of Operation and the Companys financial statements and related notes included elsewhere in this annual report. Historical results are not necessarily indicative of results to be expected in any future period. This Item 7 contains forward looking statements. These statements include, without limitation, statements relating to liquidity, financing of operations, continued volatility of uranium prices and other matters. The words believes, expects, projects, targets, estimates or similar expressions identify forward-looking statements. We do not undertake to update, revise or correct any of the forward-looking information. Readers are cautioned that such forward-looking statements should be read in conjunction with our disclosures under the heading: Risk Factors beginning on page 9. URI explores for and produces uranium in South Texas where it has two remaining production operations that are currently on stand-by: Kingsville Dome and Rosita. URI also has an estimated 101.4 million pounds of in place mineralized uranium material on 183,000 acres in New Mexico. Our operations are heavily influenced by the price of uranium both on the spot and long-term markets. The spot price of uranium, which has fluctuated from a high of $136.00 per pound in June 2007 to its recent price level of $40.75 per pound, has been the primary driver of the strategic decisions of the Company. Our strategy has been focused on two fronts: 1) advancing our New Mexico assets towards production, and 2) expanding our reserve base in Texas so we can continue to generate cash from operations to sustain our efforts in New Mexico. During 2009, with a continuing weakening of the uranium market prices that began in early 2008, we focused on reducing costs, restoration activities in Texas, public and government relations efforts in New Mexico and preserving cash. After we concluded production from our two remaining wellfields in Texas in July 2009, we no longer had a source of revenue. South Texas Production: We produced 59,000 pounds of uranium from our South Texas operations in 2009 and currently have no production operations. Current activity at Kingsville Dome is primarily focused on the restoration of depleted wellfields. The last wellfield at Vasquez was fully depleted in October 2008 and the project is now undergoing restoration. Production from Rosita was started in June 2008, but was suspended in October 2008 due to poor economics driven by increased operating costs as a result of technical operating challenges and the decreased price of uranium. We are currently in the stabilization phase of groundwater restoration at the Rosita project. Reserve development: A significant portion of the cash on hand at December 31, 2009 was generated from the $12.9 million in net proceeds received from the sale of common stock and warrants in a private placement in May 2008. The equity was raised to fund the acquisition, exploration, permitting and development of new and existing properties in South Texas to increase our resource base in an effort to extend production at our Texas operations beyond 2009 and for general corporate purposes. These activities were halted when uranium prices declined in 2008 and 2009. Due to higher costs, combined with geologic and technical risk and unknown market risk, we have chosen to suspend our exploration activities until the economics justify further activity. We are seeking opportunities for the rights to potential uranium properties in South Texas and New Mexico in geographic areas that have historically held significant uranium resources. There can be no assurance that we will be successful in the acquisition of such properties, or if acquired, that such properties will contain commercially viable uranium deposits. Production and production costs. Our uranium production was 59,000 in 2009, 300,800 pounds in 2008 and 416,700 pounds in 2007. Production began at our Vasquez project in the fourth quarter of 2004 and reached peak production output in 2005. In 2006 and 2007 we saw a decline in Vasquez production and the start-up of production from our Kingsville Dome project. This trend continued in 2007 and 2008. The start-up of production from the first new production from our Production Area 3 at Kingsville Dome in January 2007 resulted in the production increases in 2007 over 2006. In 2008, we placed five new wellfields into production at Kingsville Dome and one new wellfield at Vasquez. These wellfields were less prolific than the wellfields produced in 2007. Three of the Kingsville Dome wellfields and the Vasquez wellfields were produced out in 2008. The remaining two wellfields at Kingsville Dome completed production in the second quarter of 2009. Production at our Rosita project began with oxygen injection in June 2008 and resulted in low levels of production using our standard in-situ recovery mining techniques. In late July, we employed a series of alternative operational strategies including the use of various oxidants in an attempt to improve recovery levels. While these tests did improve production over previous levels, the higher cost of production combined with lower uranium prices did not allow the operation to continue on a positive cash basis and production was suspended in the fourth quarter of 2008. Although technically challenging, we believe the reserves from Rosita can be produced economically with higher uranium prices. We completed production at the Vasquez project and shut-in production at the Rosita project in the fourth quarter of 2008 and we shut-in production at the Kingsville Dome project in the second quarter of 2009. The Vasquez project was mined out in 2008 and is now being restored. At the Kingsville Dome and Rosita projects, we shut-in production to conserve the in-place reserve base in response to a drop in uranium market prices. We do not intend to resume production at these sites until there is a significant recovery of uranium prices. Total operating costs, total depreciation and depletion costs and total production costs incurred for the periods presented above differ from the cost of uranium sales recorded in consolidated statements of operations because of changes in the amounts recorded to inventory for the same periods. The cost of uranium sales amounts include the sales of uranium inventory on hand at the beginning of the period and do not include uranium produced during the period but not sold at period end. Total dollars expended for direct production costs in 2009 were significantly lower than 2008 as a result of the scale back of production during the year when compared to 2008. The reduced production volumes in 2009 resulted from the decline in uranium prices throughout 2008 which led to the Companys decision in October 2008 to defer new wellfield development. Production at Kingsville Dome was completed in July 2009 at which time the Company ceased having any operating wellfields in Texas. Our direct production costs in 2008 increased compared with 2007 costs. These total cost increases resulted from production being sourced from higher cost Kingsville Dome and Vasquez wellfields in 2008 and from the unfavorable results we saw from our Rosita production during 2008. Uranium Sales. In 2009, we sold a total of 95,200 pounds of uranium produced from our Kingsville Dome, Vasquez and Rosita projects, resulting in revenue of $4.7 million. In 2008, we sold a total of 285,500 pounds of uranium produced from our Kingsville Dome, Vasquez and Rosita projects, resulting in revenue of $18.5 million. In 2007, we sold a total of 434,900 pounds of uranium produced from our Kingsville Dome and Vasquez projects, resulting in revenue of $31.1 million. Overall production costs in 2009 were significantly lower than 2008 as a result of the scale back of production volumes during the year when compared to 2008. These lower volumes, which caused lower sales volumes, also resulted in lower total royalties and commissions in 2009. Our Kingsville Dome, Vasquez and Rosita projects all experienced higher production costs in 2008 than our production from Kingsville Dome and Vasquez in 2007. The higher costs at Kingsville Dome and Vasquez were the result of production being sourced from lesser quality ore reserves and the wind-down of production at each of these projects during the year. As the production life of a wellfield extends, the costs to produce those pounds is higher than when a wellfield is first placed into production. We experienced production difficulties at Rosita which forced us to try a number of methodologies in an attempt to increase our production efficiencies. The operating costs incurred, the lack of significant progress in resolving our production inefficiencies at Rosita and the decision to not make the capital expenditures to increase the number of production wells resulted in our high production costs at Rosita during the year. Our average cost of pounds sold in 2008 was $48.60 per pound with Kingsville Dome production contributing approximately 85% of total pounds sold, Vasquez contributing approximately 12% of total pounds sold and Rosita contributing approximately 3% of total pounds sold during the year. We saw an improvement in our overall production costs in 2007, With the majority of our production in 2007 coming from new wellfields at our Kingsville Dome project, we saw benefits of this historically lower cost production contributing significantly to reducing both our operating and capital costs of production in 2007. Our average cost of pounds sold in 2007 was $33.21 per pound with Kingsville Dome production contributing approximately 77% and Vasquez contributing approximately 23% of the total pounds sold during the year. Royalties and Commissions. During 2009, royalties and commissions for Kingsville Dome, Vasquez and Rosita production sold was $464,000, representing a charge of 9.9% of sales. During 2008, royalties and commissions for Kingsville Dome, Vasquez and Rosita production sold was $1.710 million, representing a charge of 9.2% of sales. During 2007, royalties and commissions for Vasquez and Kingsville Dome production sold was $3.034 million, representing a charge of 9.7% of sales. The changes in royalty percentages from 2009 to 2008 and 2007 resulted primarily from the changes in uranium sales prices year to year and the source of our production in each year. Our Vasquez leases contain a sliding scale royalty with percentages that range from 6.25% up to 10.25% dependent on our sales prices. Our Kingsville Dome leases have a 6.25% royalty and carry an additional 3.125% royalty payment to certain land owners of the property. Our Rosita leases contain 11.25% royalty rates. Operating Expenses. During 2009, operating expenses for Kingsville Dome, Vasquez and Rosita production sold was $2.7 million which included $548,000 of stand-by and other operating costs at our South Texas projects which were charged to operations. During 2008, operating expenses for Kingsville Dome, Vasquez and Rosita production sold was $6.2 million. In 2008 we incurred $456,000 of stand-by costs at the Rosita project, which were charged to operations. During 2007, operating expenses for Vasquez and Kingsville Dome production sold was $7.9 million. In 2007 we incurred $336,000 of stand-by costs at the Rosita project, which costs were charged to operations. Depreciation and Depletion. During 2009, we incurred depreciation and depletion expense attributable to our Kingsville Dome, Vasquez and Rosita production of $1.1 million. During 2008, we incurred depreciation and depletion expense attributable to our Kingsville Dome, Vasquez and Rosita production of $7.2 million. During 2007, we incurred depreciation and depletion expense attributable to our Vasquez and Kingsville Dome production of $6.2 million. Impairment of Uranium Properties. During 2009, 2008 and 2007, we determined the carrying value of our uranium project assets exceeded their fair value. Such determination in 2009 resulted in an impairment provision of $3.5 million. The impairment provision reduced the carrying value of Kingsville Dome by $2.6 million, Rosita by $214,000, Vasquez by $263,000 and other South Texas projects by $567,000 at December 31, 2009. In 2008 our impairment provision totaled $16.0 million reducing the carrying value of Kingsville Dome by $6.0 million, Rosita by $8.1 million and Vasquez by $1.8 million at December 31, 2008. The impairment provision in 2007 resulted primarily from our reducing the estimated recoverable reserves projected to be produced from Vasquez in the future and resulted in an impairment provision related to the Vasquez project assets of approximately $651,000. Accretion and Amortization of Future Restoration Costs. During 2009, 2008 and 2007, the accretion and amortization of future restoration costs was $257,000, $790,000 and $574,000, respectively. General and Administrative Charges. We incurred general and administrative charges and corporate depreciation of $6.8 million, $11.6 million and $11.8 million in 2009, 2008 and 2007, respectively. The non-cash compensation expense recorded for the years ended December 31, 2009, 2008 and 2007 resulted from the adoption of a new accounting standard in January 2006, requiring the recognition of expense related to the fair value of the Companys stock option grants. The value of each option award is estimated on the date of grant using the Black-Scholes option-pricing model. The Black-Scholes option-pricing model requires the input of subjective assumptions, including the expected term of the option award and stock price volatility. The expected term of options granted was derived from historical data on our employee exercise and post-vesting employment termination experience. The expected volatility was based on the historical volatility of our stock. We made significant reductions in salary and payroll costs in 2009 compared with 2008. The $994,000, or 31% decrease resulted primarily from a reduction in personnel headcount that resulted from lower activities created by the shut down of the Companys production during the current year. Salary and payroll costs were up slightly in 2008 compared with 2007. The $333,000 or 12% increase resulted primarily from increased personnel and benefits and a reduction in personnel costs allocated to operations and projects during the current year. Salary and payroll cost increases of $1.3 million in 2007 resulted primarily from the addition of 21 salaried positions primarily in South Texas and New Mexico during the year and the cash bonuses awarded to non-executive employees at year end 2007. The Companys legal, accounting and public company expenses had a net decrease of $236,000 in 2009 compared with 2008. The decrease resulted from reduced audit and Sarbanes-Oxley Section 404 (SOX 404) related costs during the year offset by increases in legal fees. The Companys legal, accounting and public company expenses had a net decrease of $38,000 in 2008 compared with 2007. The decrease related to lower SOX 404 audit related costs in 2008 and NASDAQ listing fees, decreased directors fees and costs related to the preparation for a planned listing on the Toronto Stock Exchange incurred in 2007. The Companys legal, accounting and public company expenses had a net increase of $306,000 in 2007. The primary increases in these costs were from SOX 404 audit related costs, NASDAQ listing fees, higher directors fees related to the addition of two independent directors during 2007 and increased director participation in strategic planning activities and costs related to the preparation for a planned listing on the Toronto Stock Exchange. These increased costs were somewhat offset by a reduction of legal costs charged to general and administrative costs during the year. The primary reduction related to a significant amount of legal activity in 2006 related to the negotiation and preparation of the joint venture in New Mexico with Itochu Corporation. Insurance costs decreased in 2009 compared to 2008 as a result of lower general liability and umbrella coverage premiums which saw reductions because of overall reductions in payroll during the year. Insurance costs increased in 2008 compared to 2007 primarily as a result of an increase in our directors and officers liability premiums which rose during the year primarily as a result of increased coverage limits in 2008 compared with the prior year. Insurance costs increased in 2007 primarily as a result of an increase in our general liability premiums. These premiums rose during the year as a result of increases in production activities seen in 2007 compared with the prior year. We also had increases in our property and casualty premiums resulting from increased vehicle coverage because of additional vehicles acquired in 2007. Bank fees also increased in 2007 as a result of additions made to our financial surety requirements for our South Texas uranium projects. professional services decreased by $101,000 compared with 2007 and was related primarily to a reduction in costs for financial advisory services provided by a non-employee director of the Company in 2007 ($80,000). The 2007 costs for consulting and professional services increased by $1.0 million compared with 2006. The increased costs were a result of heightened activities involving work performed to review and assess our New Mexico property databases for their evaluation as potential conventional mining projects ($160,000), the expansion of a broad community relations and community information education effort in both South Texas and New Mexico ($521,000), investor relations costs ($104,000), costs for financial advisory services provided by a non-employee director of the Company ($80,000) and other advisory fees in Texas ($150,000). Reduced office related costs in 2009 resulted from closures of the Companys New Mexico and Corpus Christi office locations along with peripheral office related costs reductions resulting from the reductions in work force seen in 2009. Increased office costs in 2008 compared with 2007 resulted primarily from the full year costs of the Lewisville, Texas and Albuquerque, New Mexico offices offset by cost reductions realized by the closure of the Corpus Christi office mid-year 2008. Increased office costs in 2007 compared with 2006 resulted primarily from the opening of a new corporate office location in Albuquerque, New Mexico, in October, 2007, the move of the corporate headquarters to larger office space in September 2007, the costs for the Corpus Christi office for the entire year and increases in the South Texas Kingsville operations office resulting from the personnel added during the year. Write-off of Target Acquisition Costs. In June 2008, the Company and Billiton Investment 15 B.V. agreed to terminate our agreement to purchase Rio Algom Mining, LLC, which was entered into on October 12, 2007. In connection with the targeted acquisition, we incurred costs of $1.4 million dollars which were originally recorded as a pre-acquisition cost asset. Upon the termination of the agreement these pre-acquisition costs were expensed in 2008. Net Income (Loss). For the year ended December 31, 2009 we had a net loss of $10.1 million compared to a net loss of $26.5 million in 2008 and net income of $1.1 million in 2007. On a diluted per share basis, losses were ($0.18) in 2009 compared with losses of ($0.49) in 2008 and net income of $0.02 in 2007, respectively. The 2009 and 2008 results include an impairment provision for the Kingsville Dome, Vasquez and Rosita projects of $3.5 million and $16.0 million, respectively and exploration charges of $62,000 and $1.6 million, respectively. The 2007 results include an impairment provision for the Vasquez project of $651,000 and exploration charges of $347,000. Cash Flow. As of December 31, 2009 we had a cash balance of approximately $6.1 million compared with approximately $12.0 million and $9.3 million at December 31, 2008 and 2007, respectively. In 2009, we had a negative cash flow from operations of $5.0 million, resulting primarily from our low uranium production and related sales volumes seen during the year. As a result of the deferral of wellfield development activities, our capital expenditures used in investing activities were reduced by approximately $10.2 million compared to 2008. In 2008, we generated $1.0 million of cash flow from operations, resulting from our uranium production activities during the year. In 2008, we raised net proceeds of approximately $12.8 million through the sale of 3,295,920 shares at $4.34 per share in May 2008 and $183,000 from the issuance of 169,250 shares from the exercise of employee stock options. We also used $11.0 million in investing activities, including $8.4 million of capital additions for our South Texas production projects. These expenditures primarily consisted of wellfield evaluation, delineation and development costs of $2.8 million and plant and equipment additions of $634,000 at Kingsville Dome. Wellfield evaluation and development costs were $2.4 million and plant and equipment additions totaled $1.9 million at the Rosita project during 2008. 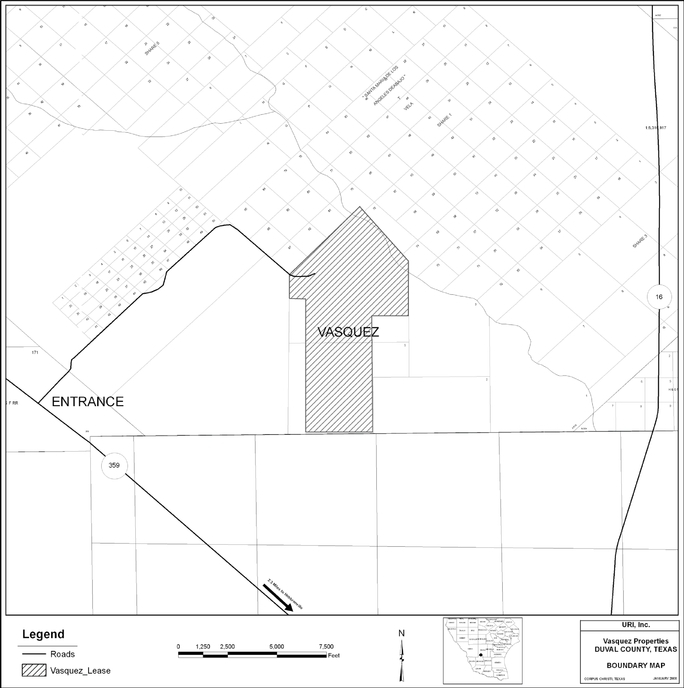 Costs at the Vasquez project were $355,000 in 2008 and were primarily for wellfield development and land holding costs and we spent approximately $478,000 for evaluation and delineation activities at the Companys Rosita South project during 2008. In 2007, we generated $11.3 million of cash flow from operations, resulting primarily from our increased production and reduced production costs incurred during the year. We also used $22.9 million in investing activities, including $15.7 million of capital additions for our main South Texas projects. These expenditures primarily consisted of wellfield evaluation, delineation and development costs of $6.5 million and plant and equipment additions of $1.3 million at Kingsville Dome. Wellfield evaluation and development costs were $2.6 million and plant and equipment additions totaled $1.8 million at the Rosita project during 2007. Costs for wellfield development and plant and equipment totaled $1.2 million at the Vasquez project in 2007 and we spent approximately $1.3 million for evaluation and delineation activities at the Companys Rosita South project. In 2007, we generated $1.0 million from the issuance of 514,000 shares from the exercise of employee stock options. As of December 31, 2009, the Company had $6.1 million in cash. The Company deferred the development of new wellfields at Kingsville Dome and Rosita beginning in late 2008. This action resulted in the wind down of our uranium production activities by mid-2009 and a corresponding reduction in uranium sales which was the primary reason for our $5.0 million of cash used in operations in 2009. As of December 31, 2009 the Company had sold its entire uranium inventory and as such, sales revenue and related cash inflows for the Company are expected to be nominal in 2010. During 2009 we continued the actions begun in the second half of 2008, significantly decreasing our cost structure by implementing tighter spending controls, reducing employment, limiting exploration activities, and reducing public and government relations activities in New Mexico and Texas. The Company expects to raise additional capital in 2010 through a financing transaction, the monetization of non-core assets or other means. Absent the ability to complete one or more of these actions the Company would need to implement significant cost cutting measures designed to maintain the Companys liquidity for a period of 12 to fifteen months. While the Company believes it will be successful in its capital raising efforts, there can be no assurance that such activities will result in the raising of sufficient funds to allow the Company to continue operations beyond 2010. However, we do project that with the cash on hand at December 31, 2009 and with the ability to sufficiently reduce our controllable costs we will be able to maintain our liquidity through 2010. The Company has obtained financial surety relating to certain of its future restoration and reclamation obligations as required by the State of Texas regulatory agencies. The Company has bank Letters of Credit (the L/Cs) and performance bonds issued for the benefit of the Company to satisfy such regulatory requirements. The L/Cs were issued by Bank of America and the performance bonds have been issued by United States Fidelity and Guaranty Company (USF&G). L/Cs for $5,761,000, $5,629,000 and $5,360,000 at December 31, 2009, 2008 and 2007, respectively such L/Cs are collateralized in their entirety by certificates of deposit. Performance bonds totaling $2,835,000 were issued for the benefit of the Company at December 31, 2009, 2008 and 2007. USF&G has required that the Company deposit funds collateralizing a portion of the bonds. The amount of bonding issued by USF&G exceeded the amount of collateral by $2.5 million at December 31, 2009, 2008 and 2007, respectively. In the event that USF&G is required to perform under its bonds or the bonds are called by the state agencies, the Company would be obligated to pay any expenditure in excess of the collateral. The table below sets forth our best estimates as to the amounts and timing of future payments relating to our most significant contractual obligations as of December 31, 2009, except as otherwise noted. Our significant accounting policies are described in Note 2 to the consolidated financial statements on page F-8 of this Form 10-K. We believe our most critical accounting policies involve those requiring the use of significant estimates and assumptions in determining values or projecting future costs. Specifically regarding our uranium properties, significant estimates were utilized in determining the carrying value of these assets. These assets have been recorded at their estimated net realizable value for impairment purposes on a liquidation basis, which is less than our cost. The actual value realized from these assets may vary significantly from these estimates based upon market conditions, financing availability and other factors. Regarding our reserve for future restoration and reclamation costs, significant estimates were utilized in determining the future costs to complete the groundwater restoration and surface reclamation at our mine sites. The actual cost to conduct these activities may vary significantly from these estimates. Such estimates and assumptions affect the reported amounts of assets and liabilities and disclosure of contingent assets and liabilities at the date of the financial statements and the reported amounts of expenses during the reporting period. The accounts of the Company are maintained in United States dollars. All dollar amounts in the financial statements are stated in United States dollars except where indicated. The Accounting Standards Codification. In June 2009, the Financial Accounting Standards Board (FASB) issued Statement of Financial Accounting Standards No. 168, The FASB Accounting Standards Codification and the Hierarchy of Generally Accepted Accounting Principles  a replacement of FASB Statement No. 162 (the Codification or ASC). The Codification reorganized existing U.S. accounting and reporting standards issued by the FASB and other related private sector standard setters into a single source of authoritative accounting principles arranged by topic. The Codification supersedes all existing U.S. accounting standards; all other accounting literature not included in the Codification (other than Securities and Exchange Commission guidance for publicly-traded companies) is considered non-authoritative. The Codification was effective on a prospective basis for interim and annual reporting periods ending after September 15, 2009. The adoption of the Codification changed the Companys references to U.S. GAAP accounting standards but did not impact the Companys results of operations, financial position or liquidity. Business Combinations. In December 2007, the FASB issued revised guidance for the accounting for business combinations. The revised guidance, which is now part of ASC 805, Business Combinations (ASC 805), requires the fair value measurement of assets acquired, liabilities assumed and any noncontrolling interest in the acquiree, at the acquisition date with limited exceptions. Previously, a cost allocation approach was used to allocate the cost of the acquisition based on the estimated fair value of the individual assets acquired and liabilities assumed. The cost allocation approach treated acquisition-related costs and restructuring costs that the acquirer expected to incur as a liability on the acquisition date, as part of the cost of the acquisition. Under the revised guidance, those costs are recognized in the consolidated statement of income separately from the business combination. In addition, the revised guidance includes recognition, classification and measurement guidance for assets and liabilities related to insurance and reinsurance contracts acquired in a business combination. The revised guidance applies to business combinations for acquisitions occurring on or after January 1, 2009. The Company adopted this standard on January 1, 2009 which did not have an impact on its financial position, results of operations or cash flows as there have been no acquisitions that have been consummated after January 1, 2009. Noncontrolling Interests in Consolidated Financial Statements. In December 2007, the FASB issued new guidance for the accounting for noncontrolling interests. The new guidance, which is now a part of ASC 810, Consolidation, establishes accounting and reporting standards for noncontrolling interests in a subsidiary and for the deconsolidation of a subsidiary. In addition, it clarifies that a noncontrolling interest in a subsidiary is an ownership interest in the consolidated entity that should be reported as a component of equity in the consolidated financial statements. The provisions of the new guidance were effective on a prospective basis beginning January 1, 2009, except for the presentation and disclosure requirements which are applied on a retrospective basis for all periods presented. The adoption of the new guidance on January 1, 2009 did not have a material effect on the Companys results of operations, financial position or cash flows as the Company owns 100% of its subsidiaries. Derivative Instruments and Hedging Activities. In March 2008, the FASB issued new guidance on the disclosure of derivative instruments and hedging activities. The new guidance, which is now a part of ASC 815, Derivatives and Hedging Activities, requires qualitative disclosures about objectives and strategies for using derivatives, quantitative disclosures about fair value amounts of, and gains and losses on, derivative instruments, and disclosures about credit-risk-related contingent features in derivative agreements. The provisions of the new guidance were effective for financial statements issued for fiscal years beginning after November 15, 2008. The adoption of the new guidance on January 1, 2009 did not result in a change in the Companys disclosure since there were no derivative instruments or hedging activities after January 1, 2009. Determining Whether an Instrument (or Embedded Feature) is Indexed to an Entitys Own Stock. In June 2008, the FASB issued new guidance on a financial instrument that is indexed to an entitys own stock. The new guidance, which is now a part of ASC 815, Determining Whether an Instrument (or Embedded Feature) is Indexed to an Entitys Own Stock is effective for financial statements issued for fiscal years beginning after December 15, 2008, and interim periods within those fiscal years. Early application is not permitted. ASC 815-15-74 specifies that a contract that would otherwise meet the definition of a derivative but is both (a) indexed to the Companys own stock and (b) classified in stockholders equity in the statement of financial position would not be considered a derivative financial instrument. ASC 815 provides a new two-step model to be applied in determining whether a financial instrument or an embedded feature is indexed to an issuers own stock and thus able to qualify for the scope exception. The application of this guidance at January 1, 2009 did not have a significant impact on the Companys financial statements. Fair Value Measurements. In February 2008, the FASB issued new guidance for the accounting for non-financial assets and non-financial liabilities. The new guidance, which is now a part of ASC 820, Fair Value Measurements and Disclosures (ASC 820), permitted a one-year deferral of the application of fair value accounting for all non-financial assets and non-financial liabilities, except those that are recognized or disclosed at fair value in the financial statements on a recurring basis (at least annually). Beginning January 1, 2009, we applied ASC 820 to nonrecurring, nonfinancial assets and liabilities. This adoption did not have a material impact on our consolidated statement of operations or financial condition. Our asset retirement obligation is classified as a Level 3 liability within the valuation hierarchy. The significant unobservable inputs to this fair value measurement include estimates of plugging, abandonment and restoration costs, inflation rate and the expected remaining life of wellfields. The inputs are calculated based on historical data as well as current estimated costs. See Note 11  Other Liabilities and Deferred Credits for additional information regarding our asset retirement obligation as of December 31, 2009. Subsequent Events. In May 2009, the FASB issued new guidance for accounting for subsequent events. The new guidance, which is now part of ASC 855, Subsequent Events , is consistent with existing auditing standards in defining subsequent events as events or transactions that occur after the balance sheet date but before the financial statements are issued or are available to be issued, but it also requires the disclosure of the date through which an entity has evaluated subsequent events and the basis for that date. The new guidance defines two types of subsequent events: recognized subsequent events and non-recognized subsequent events. Recognized subsequent events provide additional evidence about conditions that existed at the balance sheet date and must be reflected in the companys financial statements. Non-recognized subsequent events provide evidence about conditions that arose after the balance sheet date and are not reflected in the financial statements of a company. Certain non-recognized subsequent events may require disclosure to prevent the financial statements from being misleading. The new guidance was effective on a prospective basis for interim or annual periods ending after June 15, 2009. We adopted ASC 855 on June 30, 2009 and have included the required disclosures in this Form 10-K. The Company is subject to market risk related to the market price of uranium. The Companys cash flow has historically been dependent on the price of uranium, which is determined primarily by global supply and demand, relative to the Companys costs of production. Historically, uranium prices have been subject to fluctuation, and the price of uranium has been and will continue to be affected by numerous factors beyond the Companys control, including the demand for nuclear power, political and economic conditions, and governmental legislation in uranium producing and consuming countries and production levels and costs of production of other producing companies. The spot market price for uranium has demonstrated a large range since January 2001. Prices have risen from $7.10 per pound at January 2001 to a high of $136.00 per pound as of June 2007. The spot market price was $40.75 per pound as of March 8, 2010. The financial statement information called for by this item appears on pages F-1 through F-24. The Company maintains disclosure controls and procedures that are designed to ensure that information required to be disclosed in its filings with the Securities and Exchange Commission (SEC) are recorded, processed, summarized and reported within the time period specified in the SECs rules and forms, and that such information is accumulated and communicated to management, including its Chief Executive Officer and Chief Financial Officer, as appropriate, to allow timely decisions regarding required disclosure based on the definition of disclosure controls and procedures as defined in Rule 13a-15(e) promulgated under the Securities Exchange Act of 1934, as amended (the Exchange Act). In designing and evaluating the disclosure controls and procedures, management has recognized that any controls and procedures, no matter how well designed and operated, can provide only reasonable assurance of achieving the desired control objectives, and management is required to apply judgment in evaluating its controls and procedures. During the fiscal period covered by this report, the Companys management, with the participation of the Chief Executive Officer and Chief Financial Officer of the Company, carried out an evaluation of the effectiveness of the design and operation of the Companys disclosure controls and procedures (as defined in Rules 13a-15(e) and 15d-15(e) of the Securities Exchange Act of 1934, as amended (the Exchange Act)). Based on that evaluation, our Chief Executive Officer and Chief Financial Officer have certified that our disclosure controls and procedures were effective as of December 31, 2009. Management of the Company is responsible for establishing and maintaining adequate internal control over financial reporting as defined in Rules 13a-15(f) and 15d-15(f) under the Exchange Act. The Companys internal control over financial reporting is designed, under the supervision of the Companys Chief Executive Officer and Chief Financial Officer, to provide reasonable assurance regarding the reliability of financial reporting and the preparation of financial statements for external purposes in accordance with accounting principles generally accepted in the United States of America (GAAP). The Companys internal control over financial reporting includes those policies and procedures that: (i) pertain to the maintenance of records that, in reasonable detail, accurately and fairly reflect the transactions and dispositions of the assets of the Company; (ii) provide reasonable assurance that transactions are recorded as necessary to permit preparation of financial statements in accordance with GAAP, and that receipts and expenditures of the Company are being made only in accordance with authorizations of management and directors of the Company; and (iii) provide reasonable assurance regarding prevention or timely detection of unauthorized acquisition, use or disposition of the Companys assets that could have a material effect on the financial statements. inherent limitations. Therefore, even those systems determined to be effective can provide only reasonable assurance regarding the reliability of financial reporting and the preparation of financial statements for external purposes in accordance with GAAP. Based on the Companys evaluation under the framework in Internal ControlIntegrated Framework, our Chief Executive Officer and Chief Financial Officer concluded that internal control over financial reporting was effective as of December 31, 2009. There were no changes in our internal controls over financial reporting that occurred during the fourth quarter of 2009 that materially affected, or are reasonably likely to materially affect, our internal controls over financial reporting. The Companys independent auditors, Hein & Associates, LLP, with direct access to the Companys Board of Directors through its Audit Committee, have audited the consolidated financial statements prepared by the Company. Their report on the consolidated financial statements is included in Part II, Item 8. Financial Statements and Supplementary Data. Hein & Associates, LLPs report on the Companys internal control over financial reporting appears on the following page. We have audited Uranium Resources, Inc.s internal control over financial reporting as of December 31, 2009, based on criteria established in Internal ControlIntegrated Framework issued by the Committee of Sponsoring Organizations of the Treadway Commission. Uranium Resources, Inc.s management is responsible for maintaining effective internal control over financial reporting and for its assessment of the effectiveness of internal control over financial reporting included in the accompanying Managements Report on Internal Control Over Financial Reporting. Our responsibility is to express an opinion on the companys internal control over financial reporting based on our audit. In our opinion, Uranium Resources, Inc. maintained, in all material respects, effective internal control over financial reporting as of December 31, 2009, based on criteria established in Internal ControlIntegrated Framework issued by the Committee of Sponsoring Organizations of the Treadway Commission. We have also audited, in accordance with the standards of the Public Company Accounting Oversight Board (United States), the consolidated balance sheets of Uranium Resources, Inc. as of December 31, 2009 and 2008, and the related consolidated statements of operations, shareholders equity, and cash flows for each of the three years ending December 31, 2009 and our report dated March 16, 2010 expressed an unqualified opinion. The information required by this item is incorporated by reference from our definitive proxy statement for the 2010 Annual Meeting of Stockholders to be filed with the SEC within 120 days after the end of the fiscal year ended December 31, 2009. The information required by this item is incorporated by reference in our definitive proxy statement for the 2010 Annual Meeting of Stockholders to be filed with the SEC within 120 days after the end of the fiscal year ended December 31, 2009. See Index to Exhibits on page E-1 for a listing of the exhibits filed as part of this Annual Report. We have audited the consolidated balance sheets of Uranium Resources, Inc. as of December 31, 2009 and 2008 and the related consolidated statements of operations, shareholders equity and cash flows for each of the three years in the period ended December 31, 2009. These financial statements are the responsibility of the Companys management. Our responsibility is to express an opinion on these financial statements based on our audits. We conducted our audits in accordance with the standards of the Public Company Accounting Oversight Board (United States). Those standards require that we plan and perform the audit to obtain reasonable assurance about whether the financial statements are free of material misstatement. An audit includes examining, on a test basis, evidence supporting the amounts and disclosures in the financial statements. An audit also includes assessing the accounting principles used and significant estimates made by management, as well as evaluating the overall financial statement presentation. We believe that our audits provided a reasonable basis for our opinion. In our opinion, the consolidated financial statements referred to above present fairly, in all material respects, the financial position of Uranium Resources, Inc. as of December 31, 2009 and 2008, and the results of its operations and cash flows for each of the three years in the period ended December 31, 2009, in conformity with accounting principles generally accepted in the United States. We also have audited, in accordance with the standards of the Public Company Accounting Oversight Board (United States), the effectiveness of Uranium Resources, Inc.s internal control over financial reporting as of December 31, 2009, based on criteria established in Internal ControlIntegrated Framework issued by the Committee of Sponsoring Organizations of the Treadway Commission and our report dated March 16, 2010 expressed an unqualified opinion on the effectiveness of Uranium Resources, Inc.s internal control over financial reporting. The accompanying notes to financial statements are an integral part of these consolidated statements.